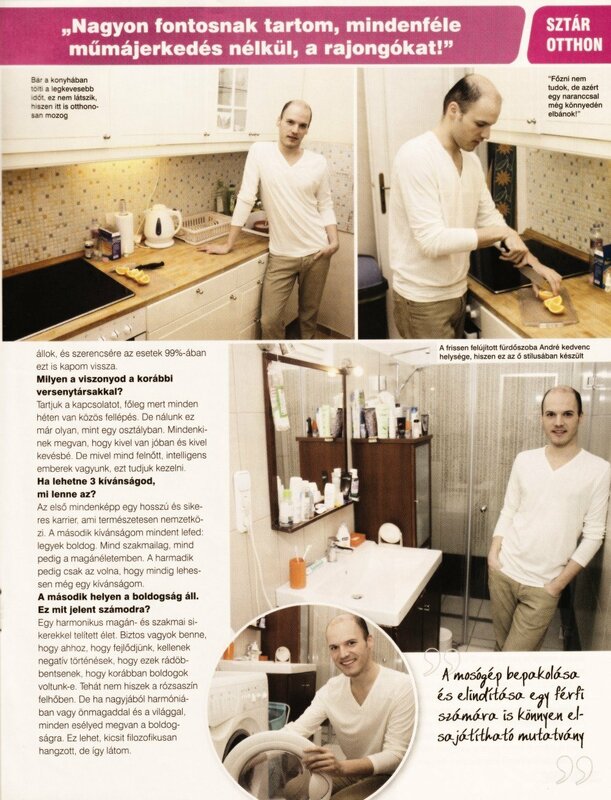 ANDRÉ IN THE "FLAT AND GARDEN"
The Bors (Pepper) Magazine issues an annex paper every other week. This week it is the annex titled Lakás és kert (Flat and Garden) being a very popular subject especially in spring. Today, on 9th April an interview was published with André in the Flat and Garden, on the occasion of which he showed the readers the flat, where he spends his days in pleasant surroundings and he is able to replenish himself among his favourite books before and after his concerts. 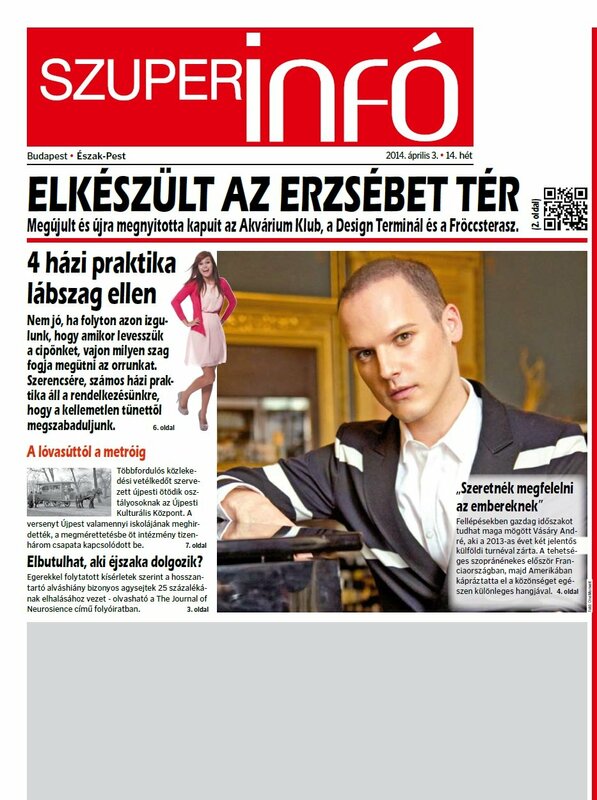 The recent paper of the Music Academy of Miskolc, titled MEgazin contains an interview with André on the occasion that he continues his studies started in the Liszt Ferenc Music Academy in Budapest there in Miskolc. The interview reveals many new details about his career, his previous studies, but we can learn his opinion about such more comprehensive issues like the overall quality of music education, or even the social responsibility. 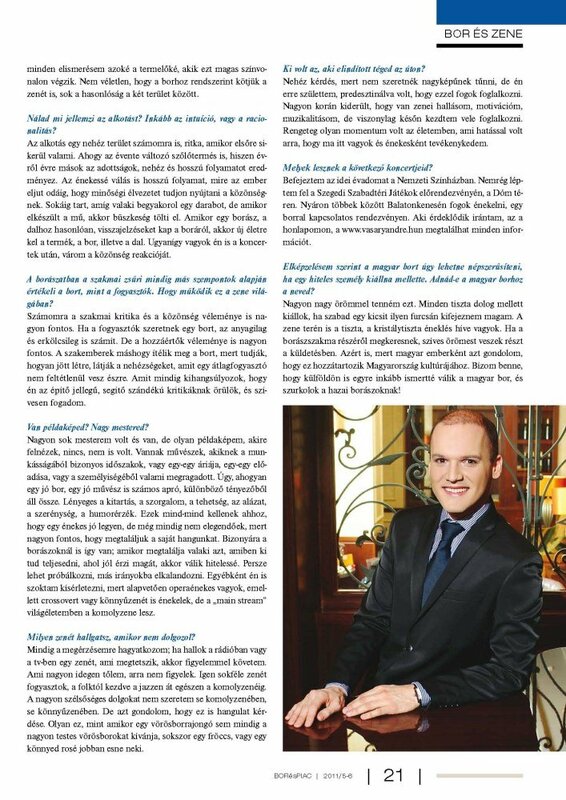 Blikk.hu also asked André about the special event when he had the possibility of opening the world famous Celtic Woman's concert with his short program in Budapest Sport Arena. It turns out also from this article that it was an unforgettable experience for him to take part in this international production. 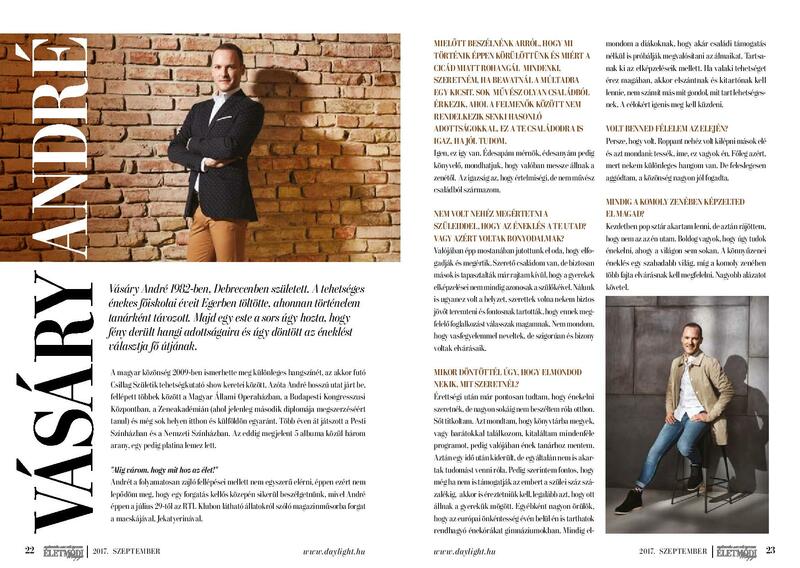 "I LOOK FORWARD TO WHAT LIFE BRINGS"
The Életmódi Magazin (Lifestyle Magazin) reaches its health conscious readers with sophisticated outlook and advices for healthy lifestyle, recipes, fashion and travelling in large number of copies. 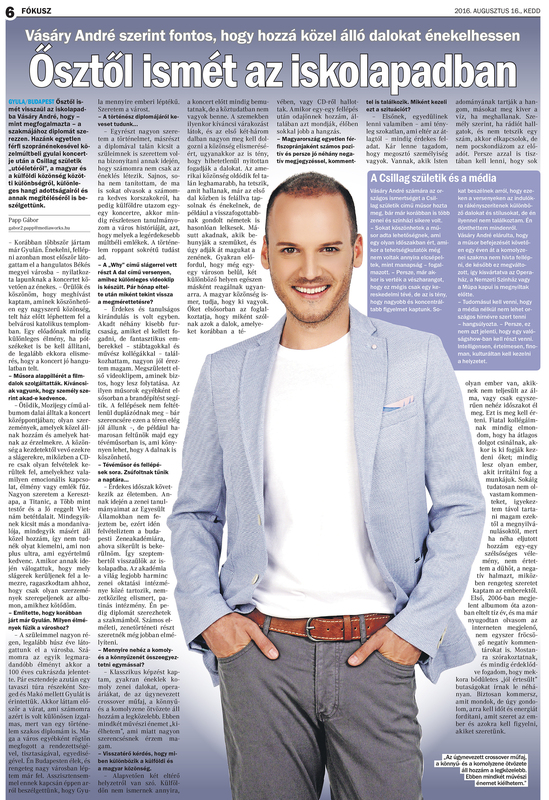 In the "Star column" of its September issue André answers questions regarding the beginnings of his career, music , his plans and we can even learn a bit about the way of his perfectionism. The article can be read here as follows illustrated with photos taken by Zsolt Nyulászi. During the second weekend of August people in Győr are excited about the Baroque wedding program. It is now the 25th occasion when it is a real time travelling going on in the streets of the town decorated in Baroque style, while the couple of the real wedding and their relatives are also dressed in Baroque clothes. 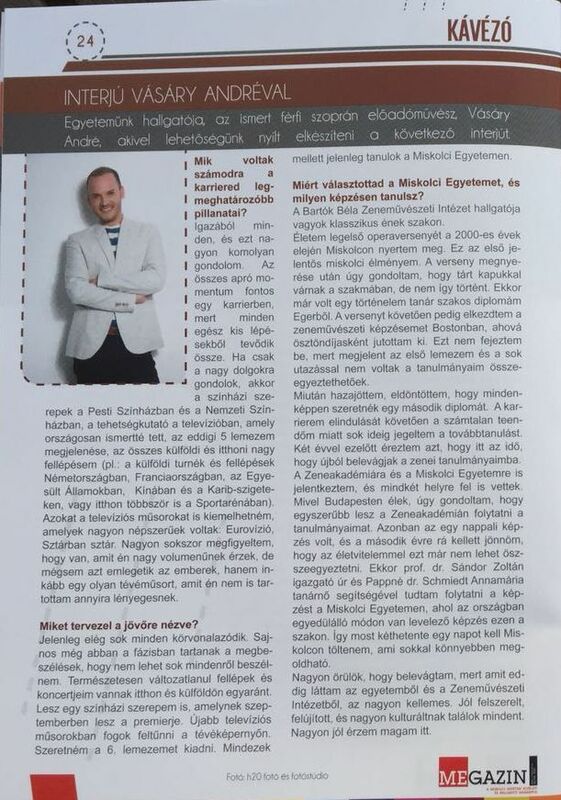 The programs of the spectacular ceremony ends by André's concert on Sunday evening, the interview below with him was published in Győrplusz Hetilap (Weekly Paper) on this occasion. There is no recipe for success to apply for everyone. André Vásáry's fortune for example was decided in the skies. 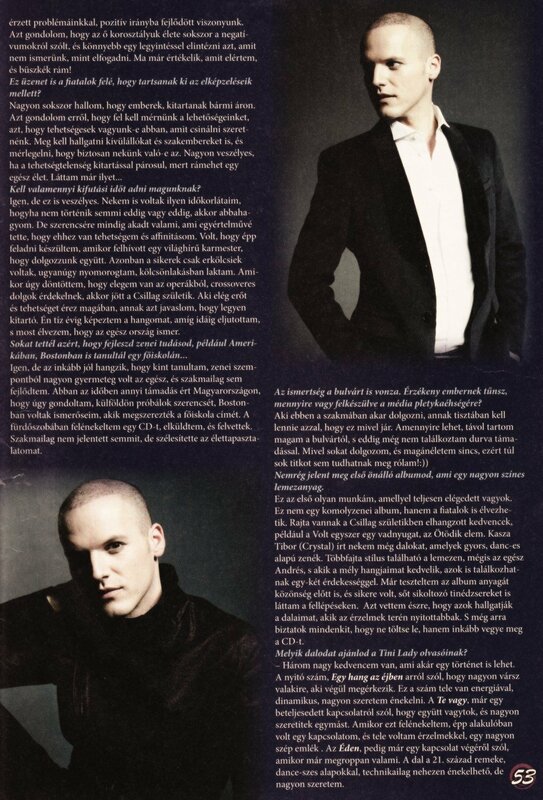 He remembers the beginnings of his career in this article of Hot Magazin. 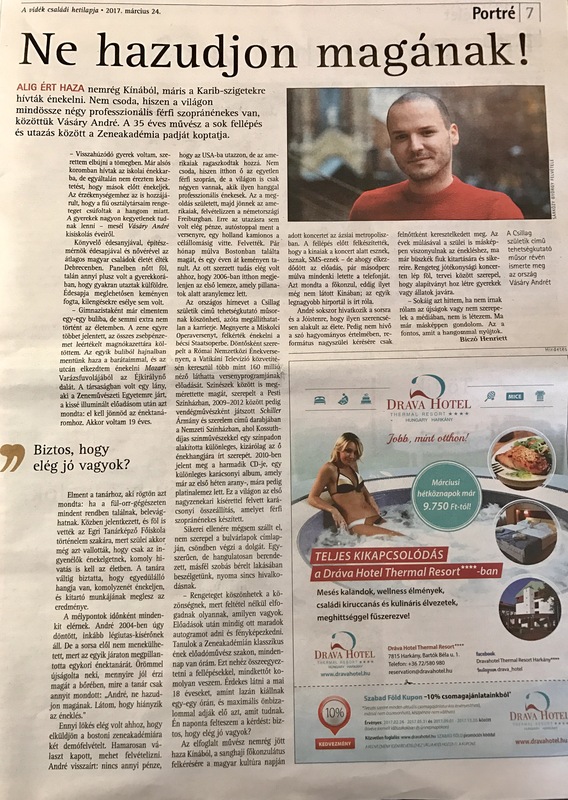 On 24th March the paper Szabad Föld (Free Land) published an interview with André not only depicting his portrait but summarizing also his career so far for the readers. The article unfolds André's resolute perseverance for using his born special vocal gift and talent as to become a singer at the age of 19. Since then he keeps on learning hard and follows irresistibly his own special path. The trip to China was not only about preparations, compilation of the concert program, practice and rehearsal, but there was even time for some sightseeing as well. And if one tries to explore a so far unknown town as a tourist, adventures always happen. In particular in China. 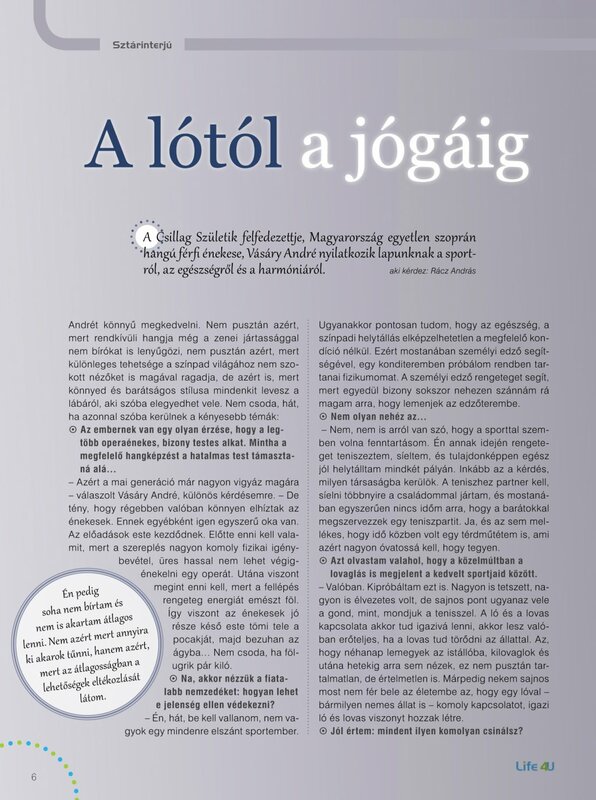 André also had such a story to tell to the Lokál Magazine's readers. 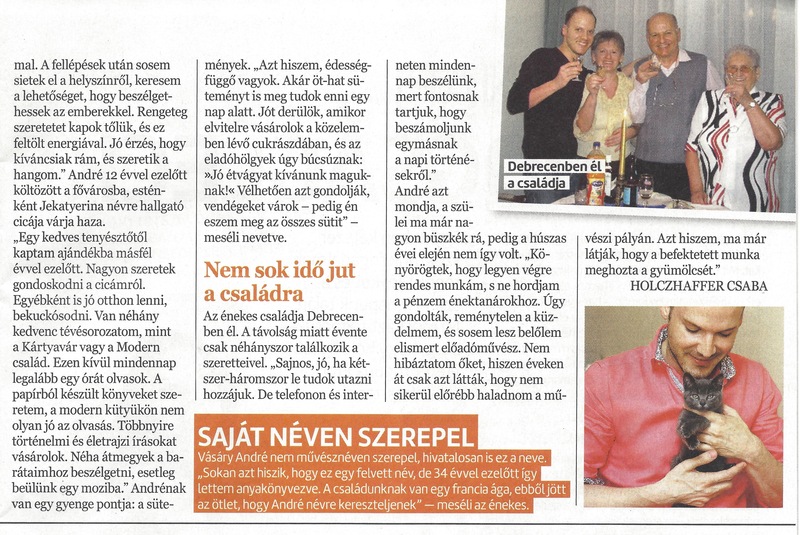 The monthly recipe magazine titled Vidék Íze (Rural Flavour) published a two page interview with André about his childhood experiences regarding meals: what are his favourites to eat and we can also learn a recipe he prepared just to please the magazine readers. 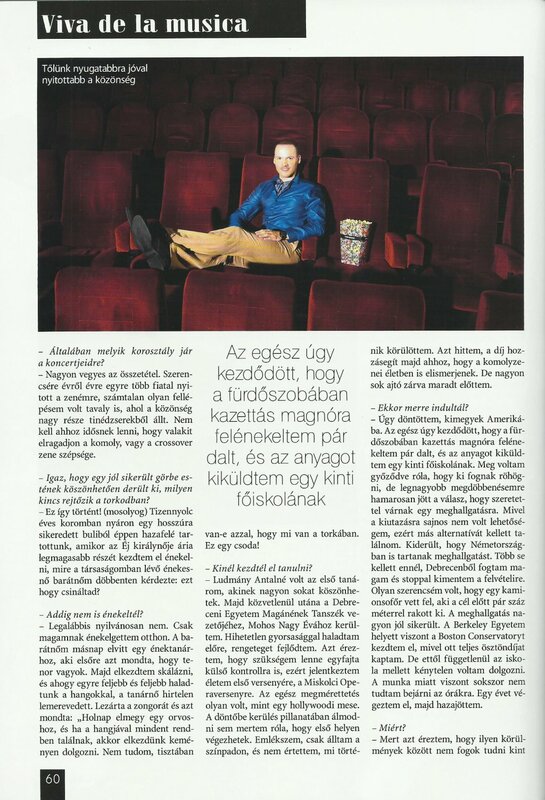 Reckoning and thanksgiving are parts of the Christmas preparations - told André to Délmagyarország's supplement on Saturday in the company of an actor and an anchor woman. "One of the strongest feelings is thanksgiving" - he told. For what is he grateful and how he prepares for Christmas, what does he plan for the holidays, you can find out from the article below. 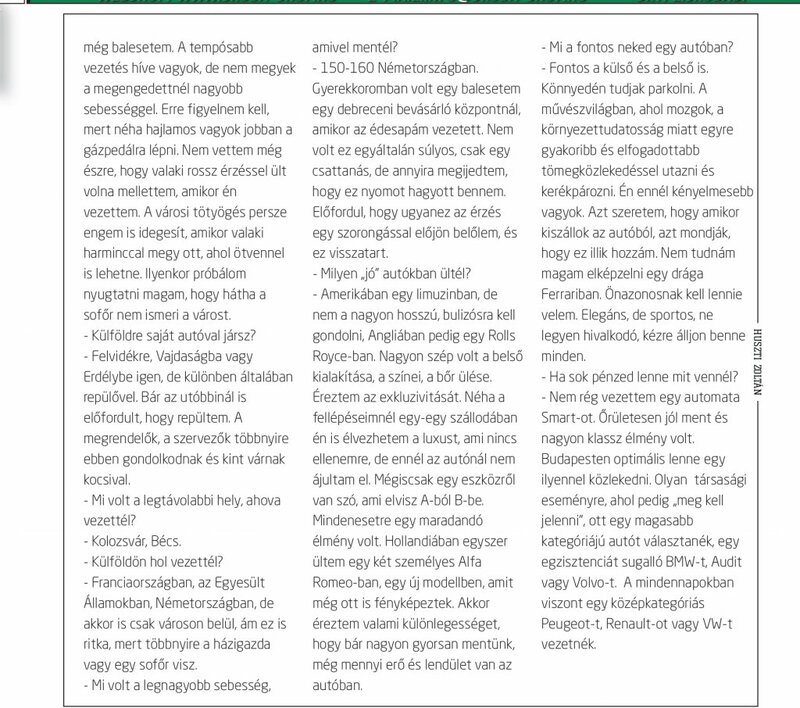 The September issue of Regio Regia, the value generating business magazine of the Central Transdanubia region published an interview with André in its column titled "Treasure hunt". The powerful conversation was made this August on the concert given by André in the Catholic church in Környe on the occasion of the church's 150 years of existence. The article includes lots of interesting topics starting from the emotional impact of the church concerts through the messages of the songs arriving to the visible and invisible sides of the singers' profession. It's worth reading. 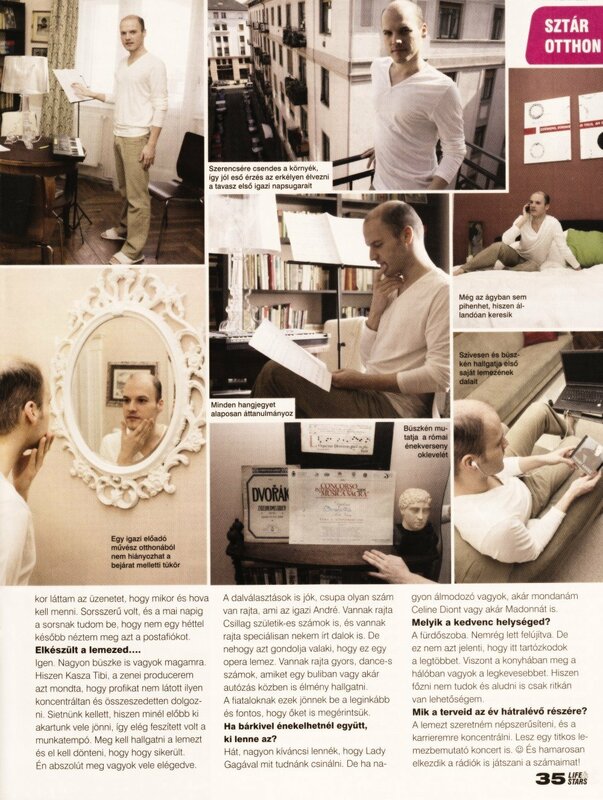 "I'M TRYING TO LIVE TO BE USEFUL"
This article was published in the magazine specialized for pharmacy assistants about André's thoughts that had been left out from an earlier interview with him in Patika Magazine due to lack of space. Now we learn new information about his life style, his demands for quality, his way of performance, his self-knowledge and charity activities. "I am trying to live to be useful" - he said. André Vásáry has already been stubborn and self-willed even as a child. But their conflicts have most often been arranged by the love between them and the fact that almost always his mother's opinion was right. Magdolna tells stories about André's nature in his childhood and as an adult while André speaks of their mother-and-son relationship. Many feel like André Vásáry the only male soprano singer of Hungary could worthily represent Hungary on the Eurovision Song Contest. 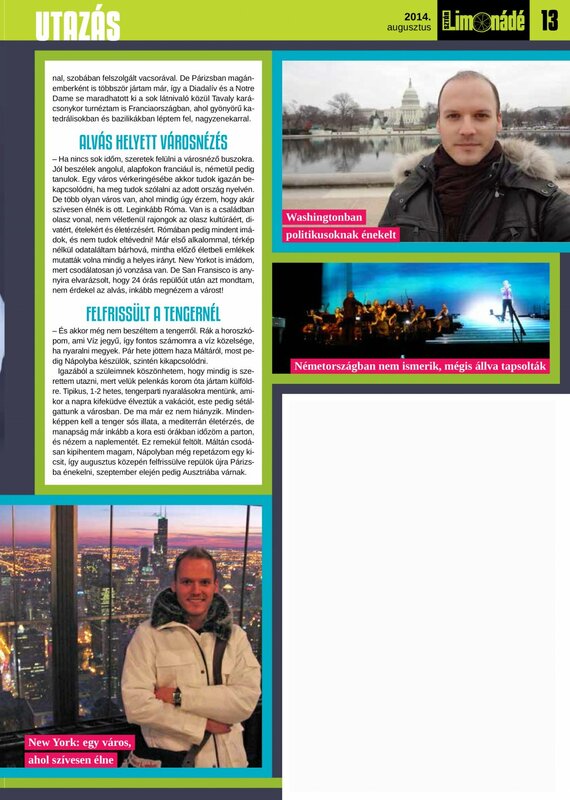 The interview of Szuperinfo can be read in the issue of 18th February. 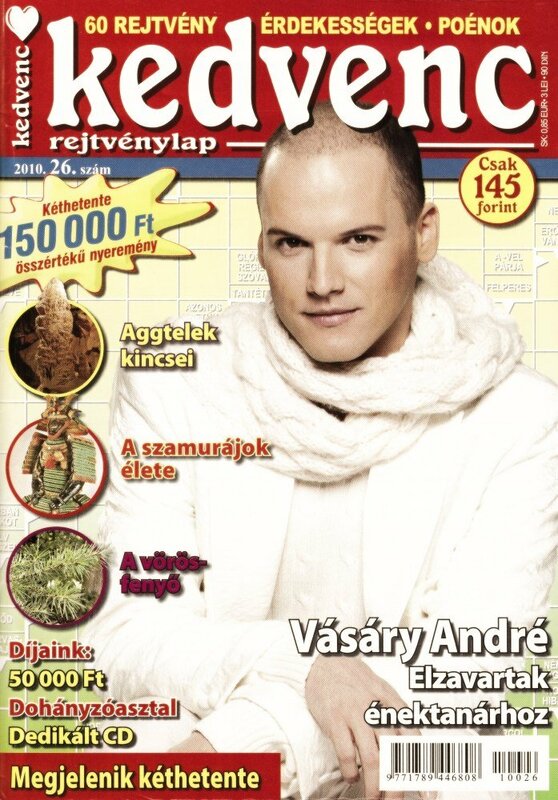 André can be seen on the cover of the Népszava TV Magazine enclosure of 27th January 2016, and you can also find an interview with him in the paper inside as well. 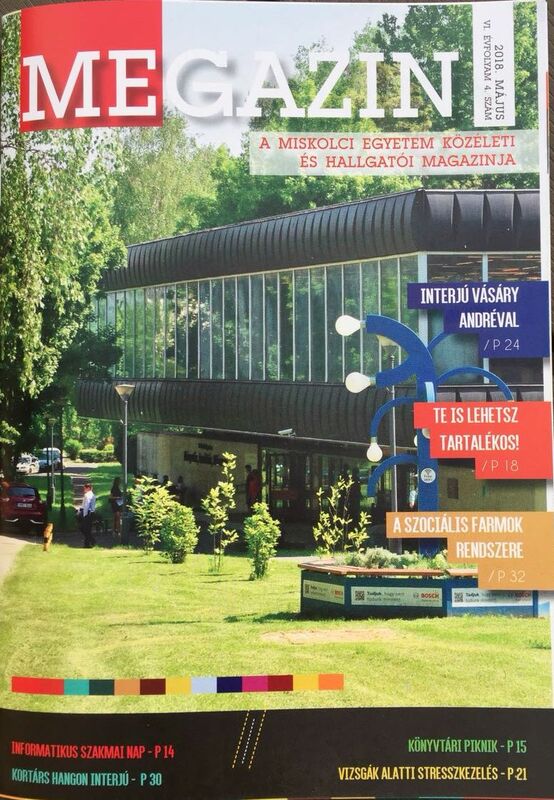 A cover interview of Patika (Pharmacy) Magazine for its October issue was made with André. Look for it in the pharmacies! André talked about recreation, work, and his latest concerts to the Kedvenc (Favourite) Magazin, and from the riddles near the interview you can also find out his favourites as well! 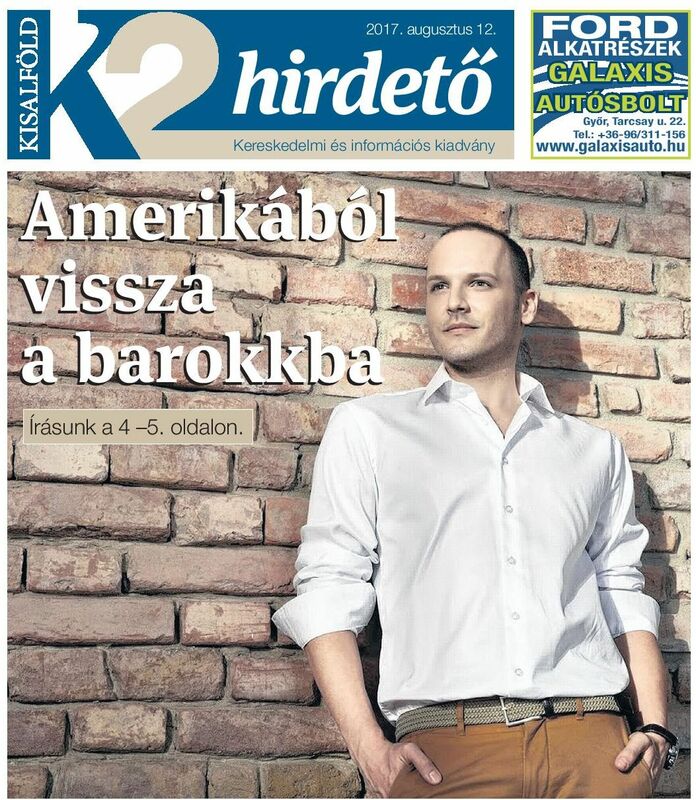 This interview with André was made for daily paper Kisalföld in Győr during André's Advent tour. André Vásáry performs in Győr this autumn once again. André's latest album has already been gaining ground among university students as well. 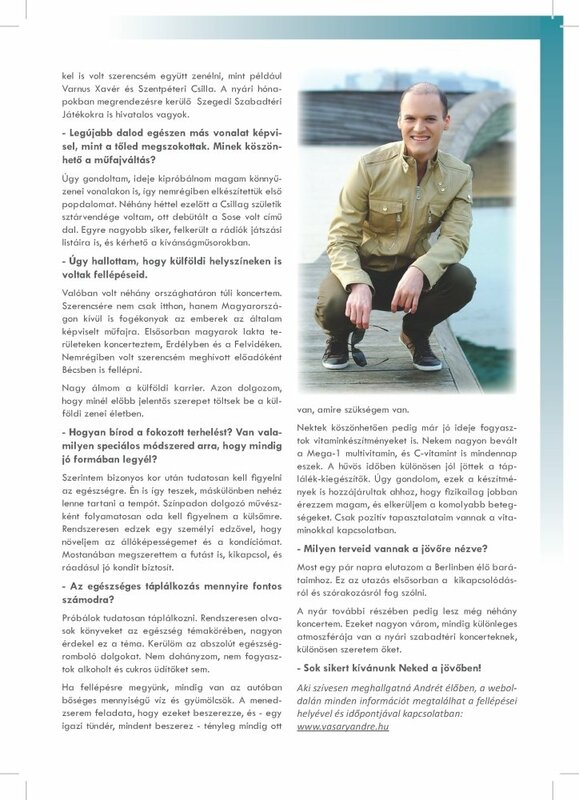 The recently published exclusive interview made with him can be read in the national higher educational style magazine. I'm speeding briskly, but safely - said André when the reporter of Lóerő ("Horsepower") magazin interviewed him about his driving customs. An exciting pitched, striking individuality. He is André Vásáry, the only male soprano singer of Hungary, who owes it to his luck that it has turned out what a wonder he is hiding in his throat. 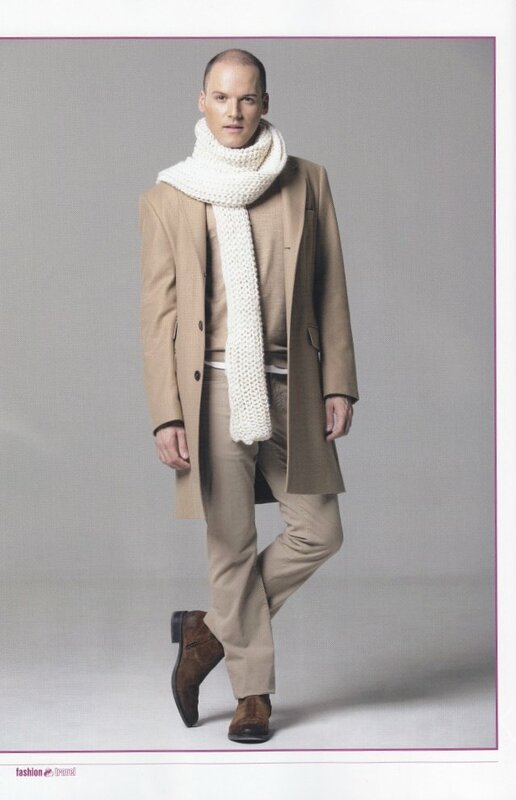 Source: Pepita Magazin February 2015. On the new album to be released in the middle of November we are to listen to soundtrack music in thrilling processings. The artist representing basically the classical line now guides his audience into his other favourite genre, the crossover style. 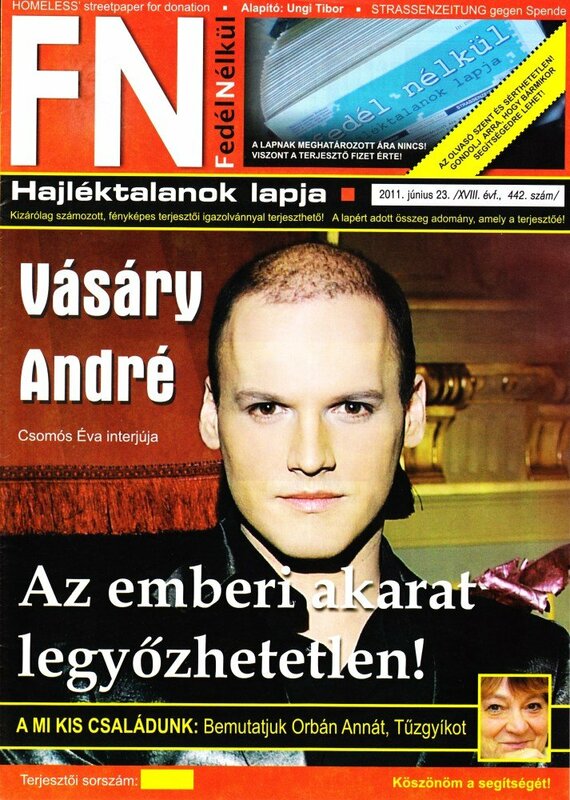 André Vásáry has become known by the nation as the male soprano of the Hungary’s Got Talent Show (Csillag születik). Before his debut in the TV show he has tried his luck as a singer in many places, even in America. Following his TV appearance he has become an acknowledged singer and recorded already his third album, but also devotes lots of his time even for charity activities. André Vásáry has just released his brand new album titled Movie Ticket. On this album he sings the songs in a way as no one else before. For a long time he has not found his place in the line, but by now he has also ended up seeking it, and records his albums with his own special voice being characteristic just for him. Meanwhile he has many appearances abroad and all over the country as well. In this interview you can read about André's travelling habits and experiences. 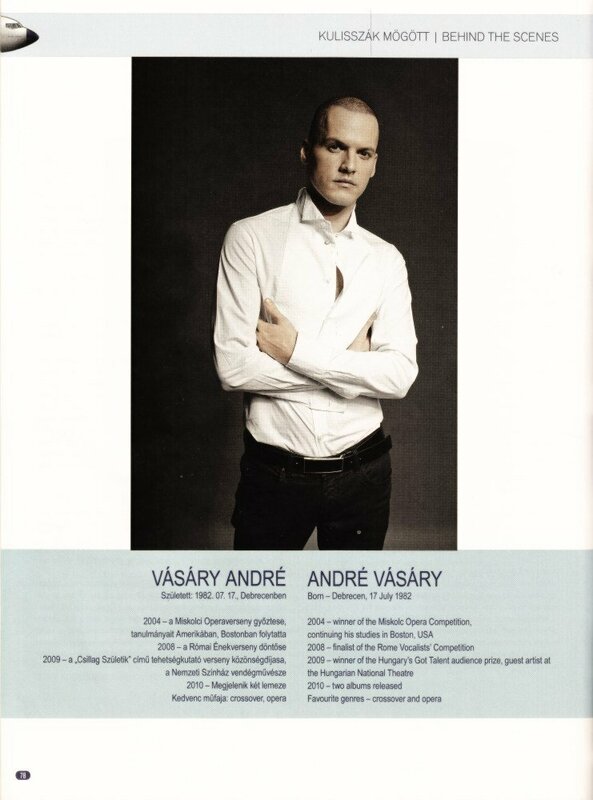 In the August issue of Taxi Magazin an interview was published with André. 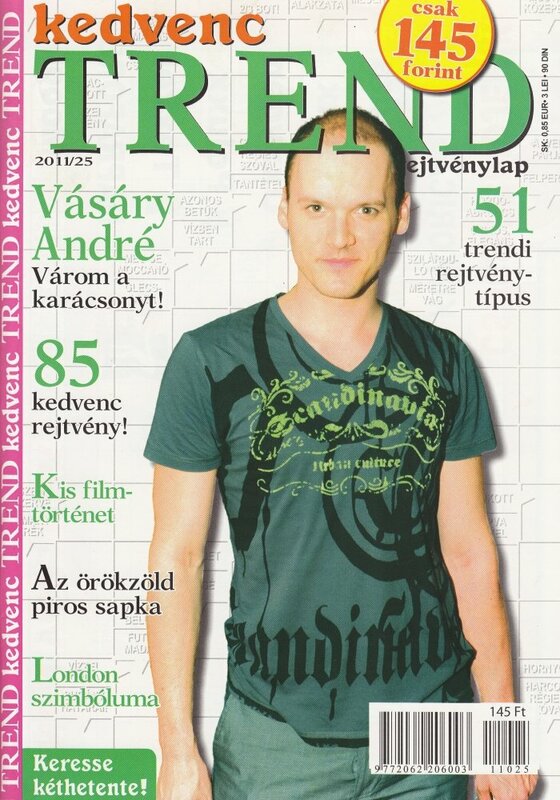 We can meet André on the cover of the Rendelő (Surgery) Magazine! Inside he tells us, among others, about his new album and his plans in the interview which can be read in the November issue of the Magazine. 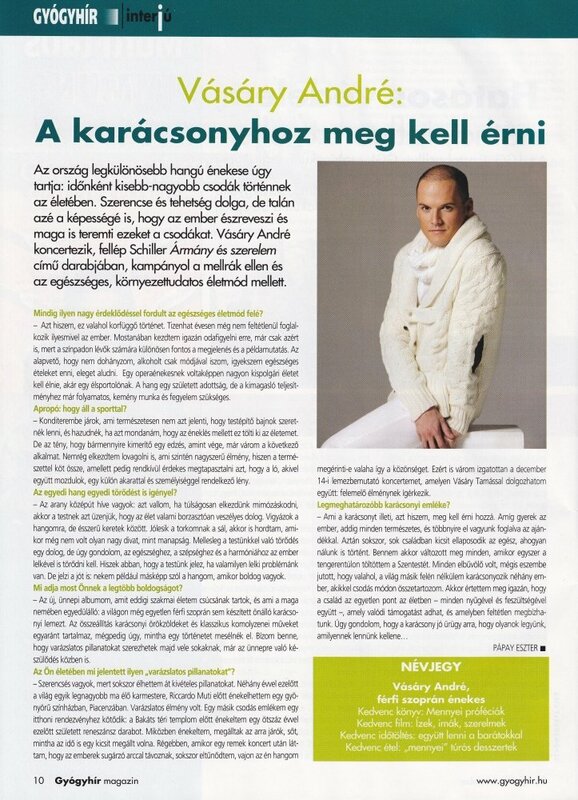 Discovered by Hungarian Got Talent 2009, the only male soprano singer of Hungary has given an interview to our magazine about sport, health and harmony. 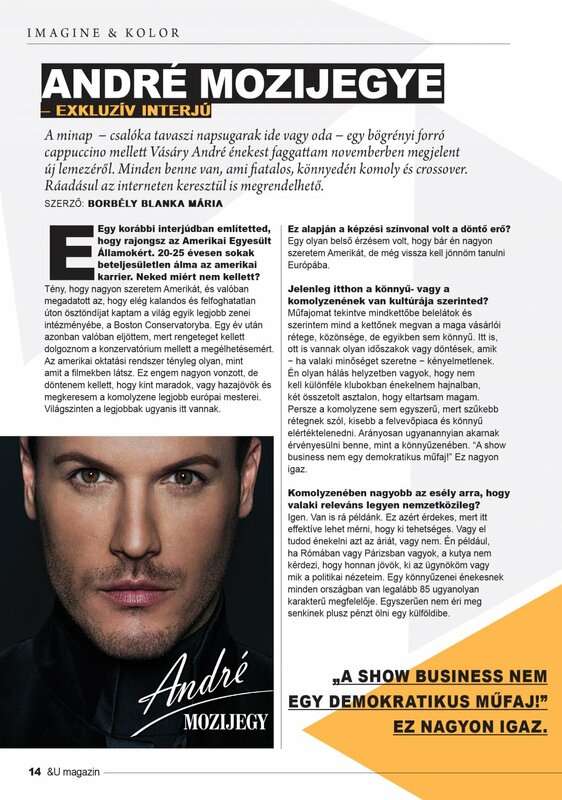 The interview with André appeared in Style Magazin on 4th August 2014. Without taboos. About his internal journeys, his poverty before popularity, about the US, why he had to leave, and mainly, why he had to return. About castration and the rumors around it, how he forgave his parents, life according to rules, and the unusual singing lessons. 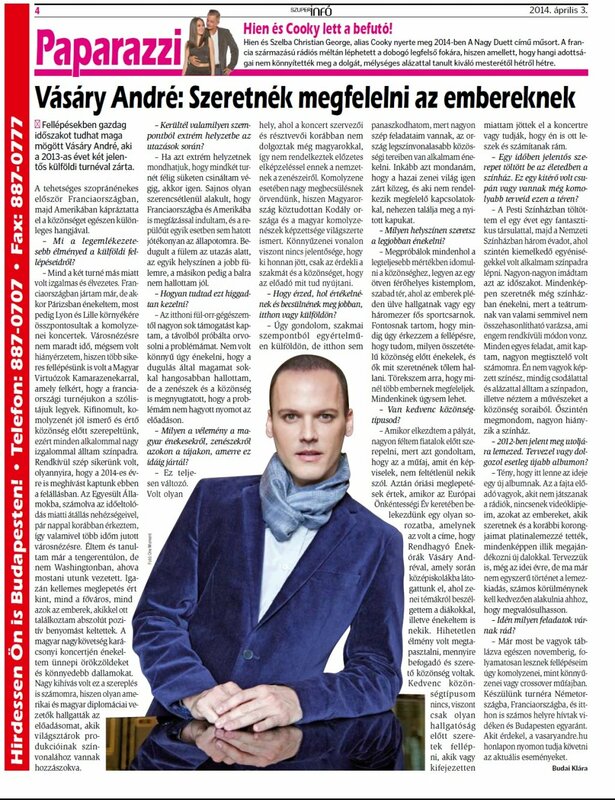 This is Hungary's only male soprano, André Vásáry - beyond the stage. 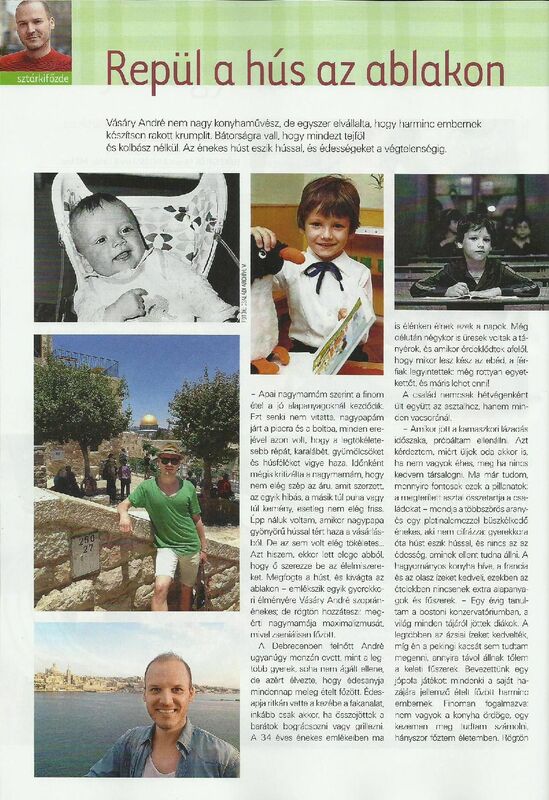 An interview was published in the August number of the Humanitás (Humaneness) magazine. Upon request of Benedek, a little boy fighting with a musculoskeletal disease, André told the story that he had already experienced as well, even if provisionally, the great number of everyday difficulities of being restricted in his movements. His special voice and his future plans are also mentioned in the article. Although André Vásáry, the newfound of the one-time Hungary’s Got Talent show is considered to be a rather divisive personality, but he is not at all disturbed by that. What is more, he is really glad about it as in the today’s world being full of an overwhelming number of talent shows people still know exactly who he is. Due to his rare vocal talents he provides a unique treat to his fans who have astonished the singer with a very special gift as to express their true admiration. 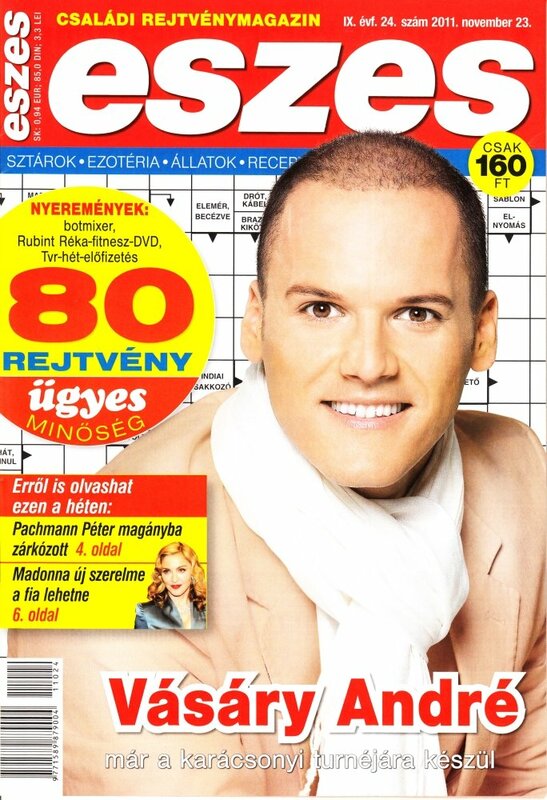 André informs us about his coming Christmas concert tour and his private life in the magazine titled “Eszes” (Smart), what’s more you can get interesting news about the singer from a crossword puzzle as well. The bygone year ended rather pleasantly for André Vásáry, since he received a new gold record and an own star in the universe. 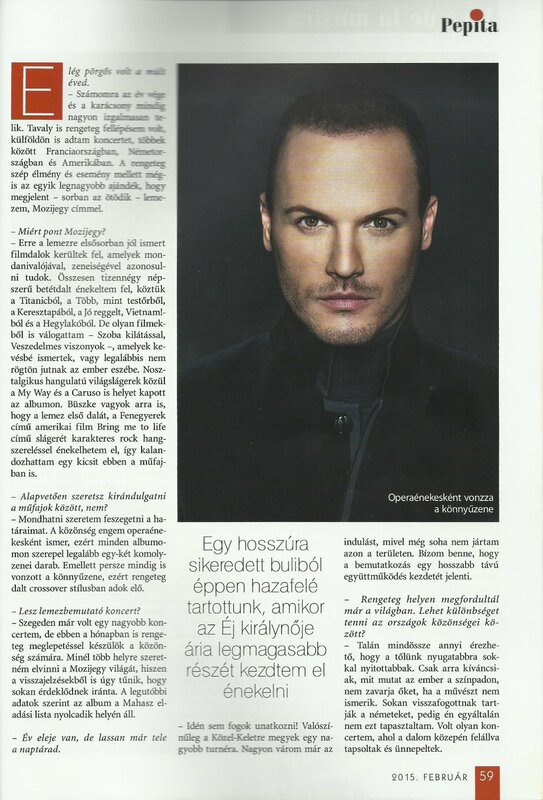 The only male soprano singer of Hungary works now on his next album in which the emotions will get the leading role. In the conversation the artist tells us some details about his coming album and summarizes the events of his last year. 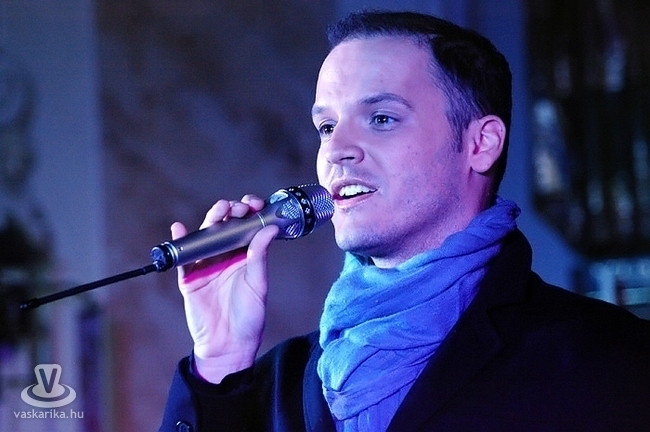 He is the only male soprano singer in Hungary; the one who has brought the classic genre closer to the people, when singing on a talent contest show. André Vásáry is not thirty years old yet, but has already performed on numerous international grand stages and we can only guess how many more of that is waiting for him. Nevertheless the young singer informs us about his social role taking one after the other instead of a steadfast international career building. He appears on aid concerts, and holds irregular singing lessons at schools. The owner of the most peculiar voice of the country believes: time to time smaller and even greater miracles come to happen in his life. It is a matter of luck, but maybe of also an ability as well to notice and even to create such miracles yourself. André Vásáry gives concerts, plays a role in a play of Schiller titled Intrigue and Love, takes part in campaigns against breast cancer and stands up for driving an environment-conscious life-style. 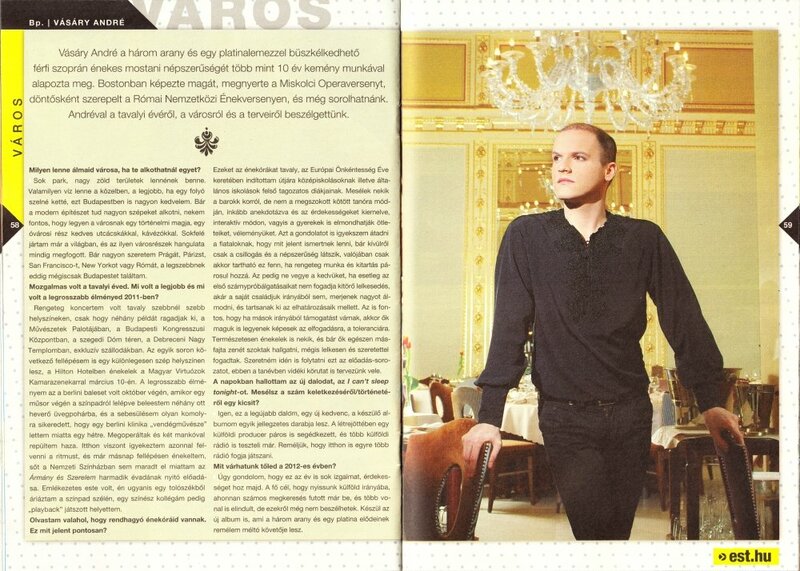 There is an interview with André in the March issue of the magazine Rejtvény Koktél (Riddles Coctail). Although André Vásáry has become a trained opera singer at the expense of a ten year long hard work, we could not have found his name on the most significant opera stages of Hungary so far. The young man from Debrecen owns a very rare gift: he belongs to those, rather few in number, who in spite of being men, are able to sing in the soprano lage. He won the prestigious Opera Contest of Miskolc in 2004 to no avail; the gates didn’t open for him towards becoming known and acknowledged. Neither the professionals, nor the audience were able to accept and treat his unique and extraordinary capabilities on their real value. But the situation has changed from one day to another. The RTL Club’s Hungary’s Got Talent show offered possibility of showing up not exclusively for pop singers, but also for other talented representatives of more kinds of arts. That was how he could be included into the show popularizing a domestically little-known genre, the crossover, and at the same time he flipped everybody on the nose making a face and doubting him. While paddling in the love of the audience he got into the final four. And what happens to him recently? 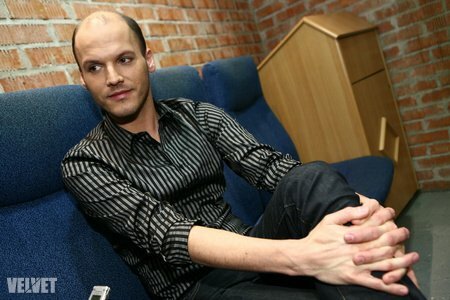 His third album, released in November, has gained a Gold and a Platinum Record; in December he gave a sensational concert among the walls of the Congress Centre, and according to the very latest information he received a nomination for the most prestigious domestic musical award, the Hungarian Fonogram Musical Award 2011 respectively, in the home-made Contemporary Classical Album of the Year category. EACH PERFORMANCE OF ANDRÉ VÁSÁRY IS UNIQUE AND UNREPEATABLE. He was finalist in Hungary's Got Talent Show in 2009. His special voice, with its wide scale SOPRANO range and his supreme talent fascinated the audience. He is a proud owner of three gold and one platinum records. Many articles have already been published about André: we could read not only about the unmatched beauty of his voice but about his family, his partner, and his friends as well. Nevertheless we know much less about another special contact of his, as not too many journalists have interrogated him about the kind of relationship he nurses with animals. 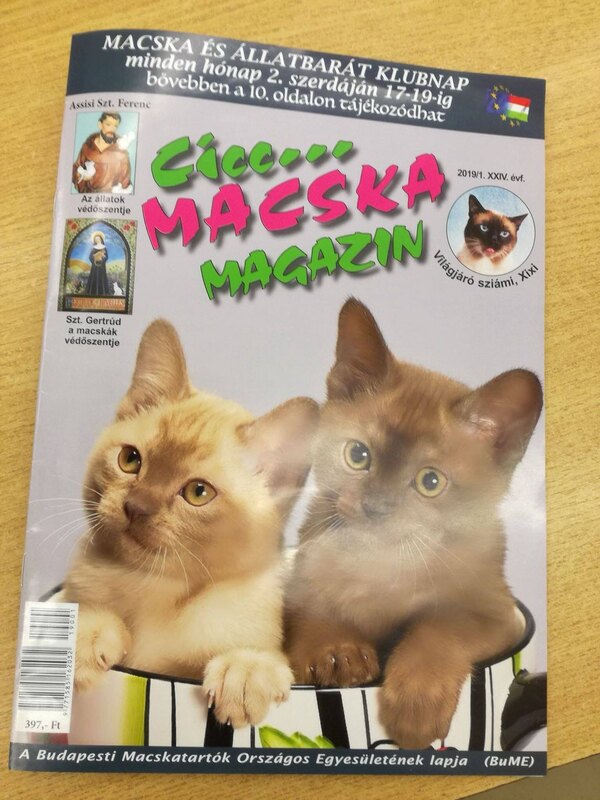 From the winter edition of the magazine „Házi kedvencek” (Pets) we can now find it out. 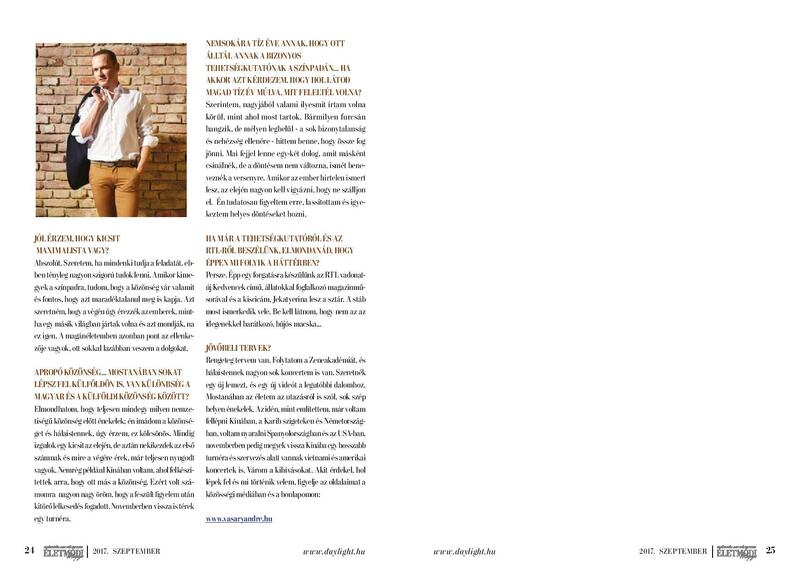 There is an interview with André in the April issue of Fidelio magazine. In this conversation he informs us not only about his recent concert in the Palace of Arts but also about his future plans. 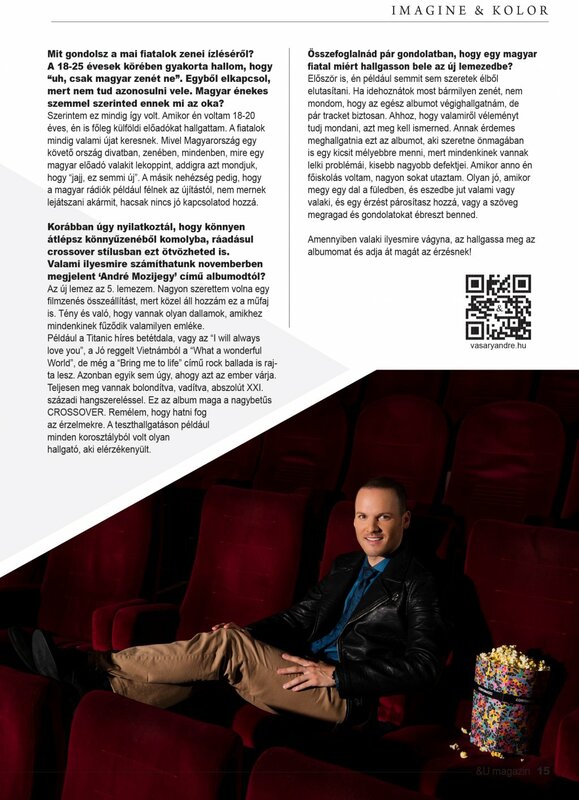 In the May issue of Panoráma magazin (Panorama Magazine), the illustrated magazine of Hungarians living abroad, an interview was published with André. 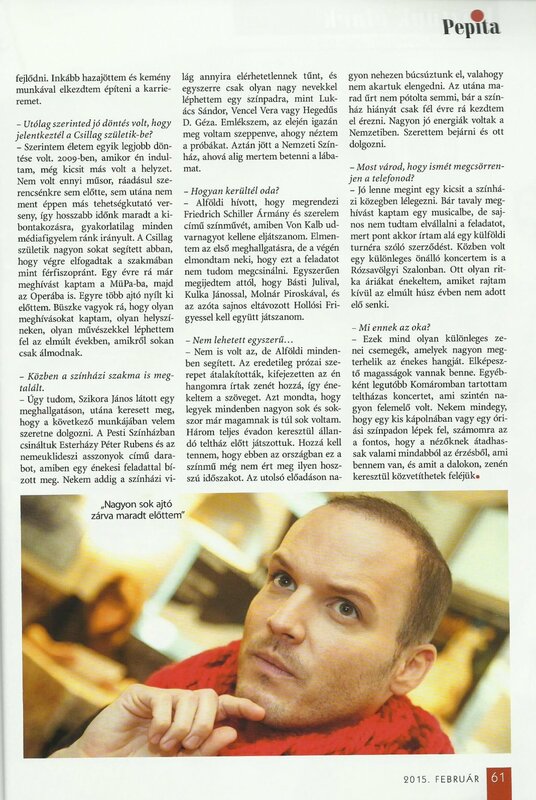 "I LOVE THE ENGLISH LANGUAGE"
You can read a conversation with André in the summer edition of the magazin "5 Perc Angol" (Five Minutes English). 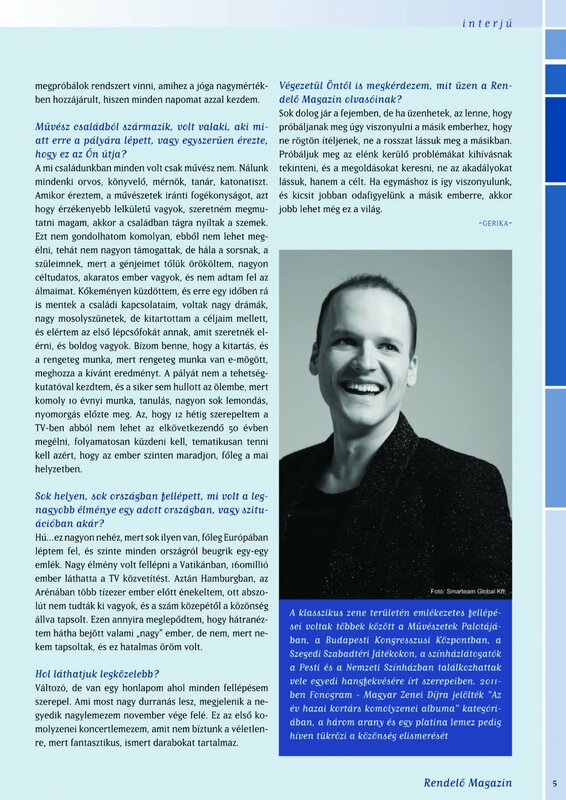 In the interview many topics are mentioned including the events of his summer period, his future plans, but first af all language learning presented itself a main issue of course due to the profile of the magazine. 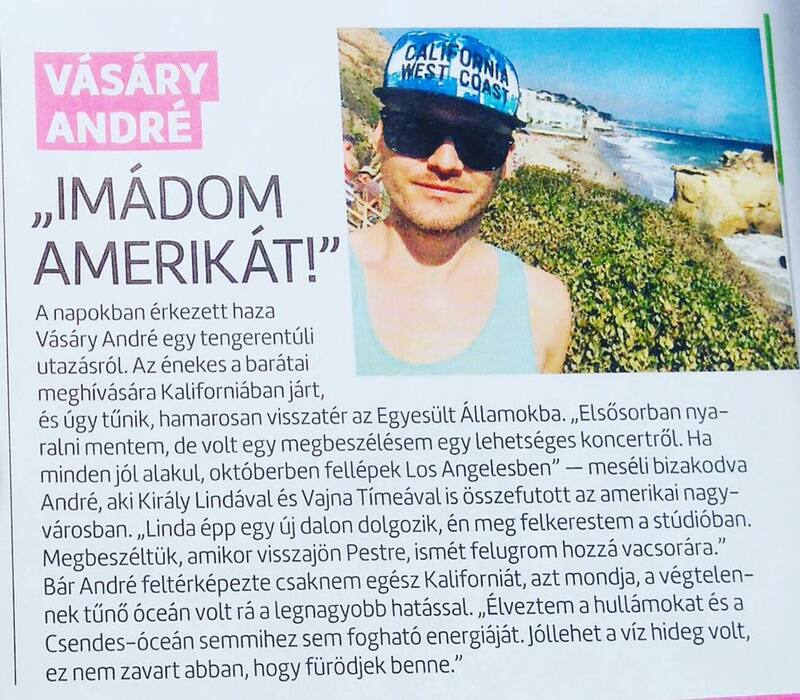 André gave an interview to the Fitt Vagyok (I am fit) magazine about sports, relaxation and vacation. 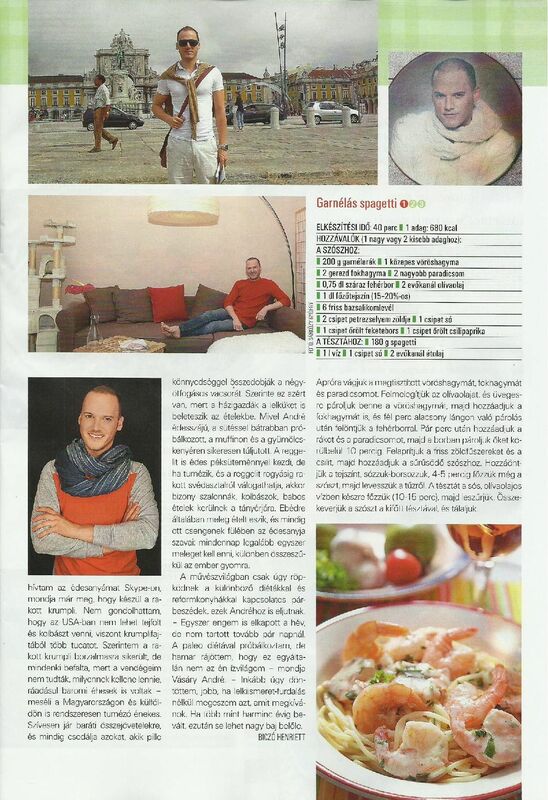 André gave an interview to Gasztro Magazin talking about cooking, gastronomy and his favourite foods. 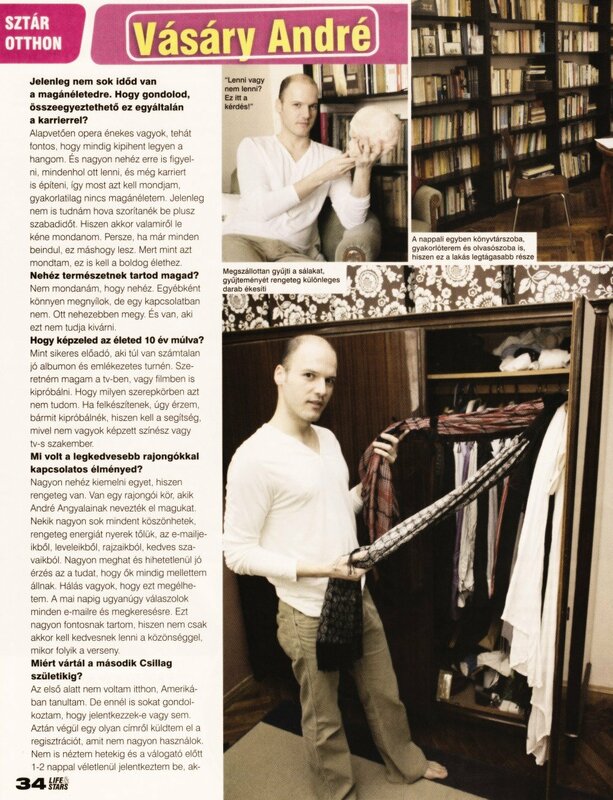 "I WOULD LIKE TO LIVE UP TO THE EXPECTATIONS OF THE PEOPLE"
André shows us his flat in the column "Visiting" of Kiskegyed Otthona Magazin (Kiskegyed Home) in its issue appeared on 5th June. 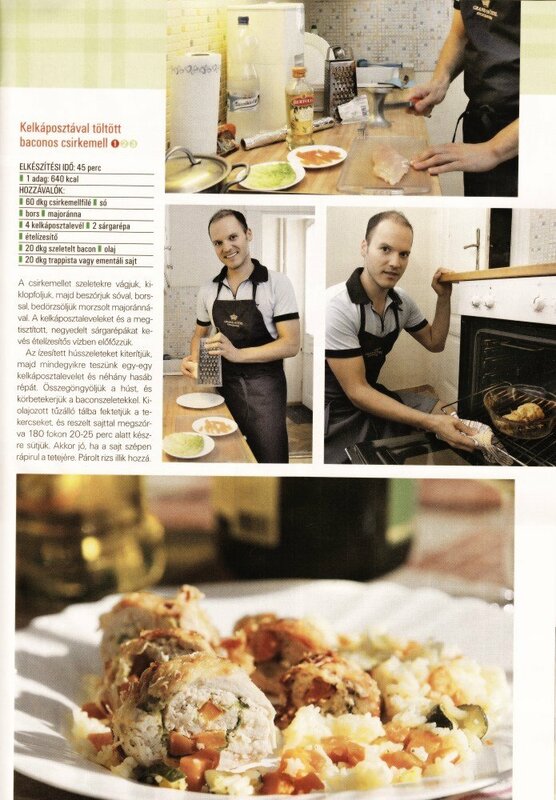 André is the star chef of the February issue of the Príma Konyha (Cool Kitchen) Magazine. 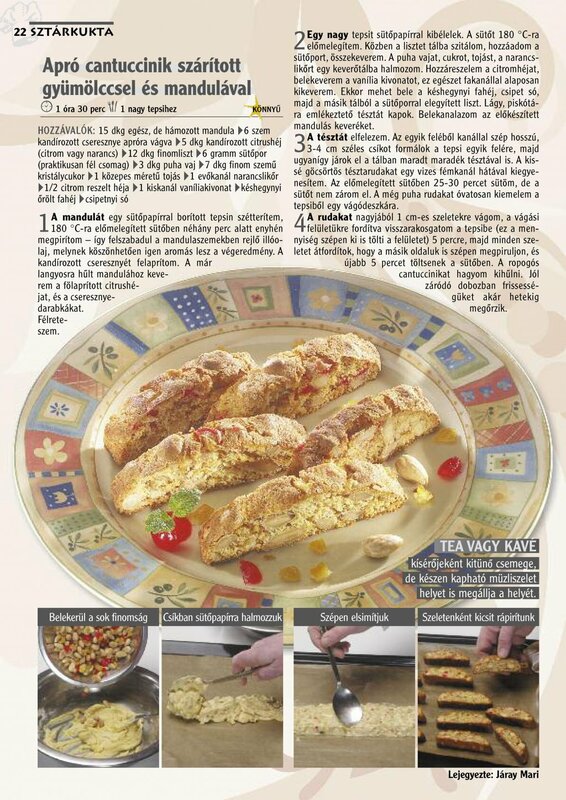 He has prepared for the occasion with lots of fine recipes included into the article. Ask for the magazine at the newsagents’! 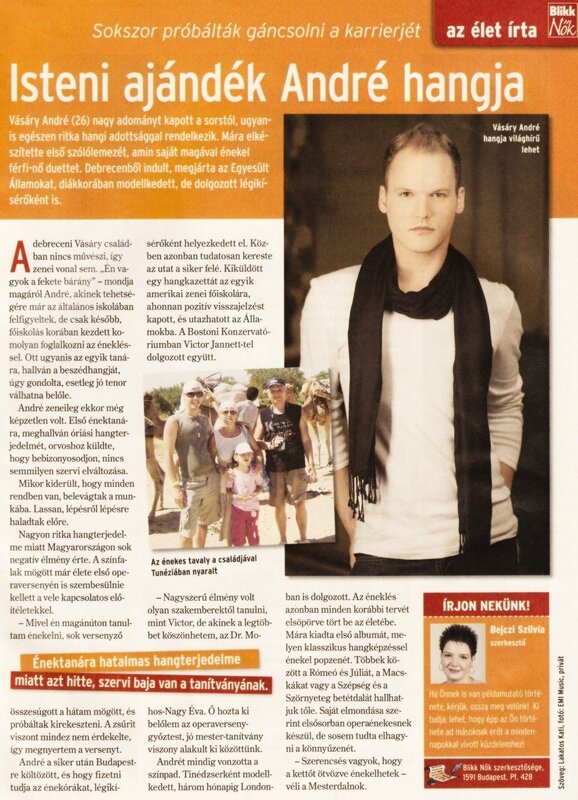 An article in two pages has appeared about André in the Like magazin of this week. The topics of yoga, relaxation and relationship are all included in the interview. Three gold records, one platinum record and numerous contests mark the professional way of that young man who has been recognized by the general public some years ago. 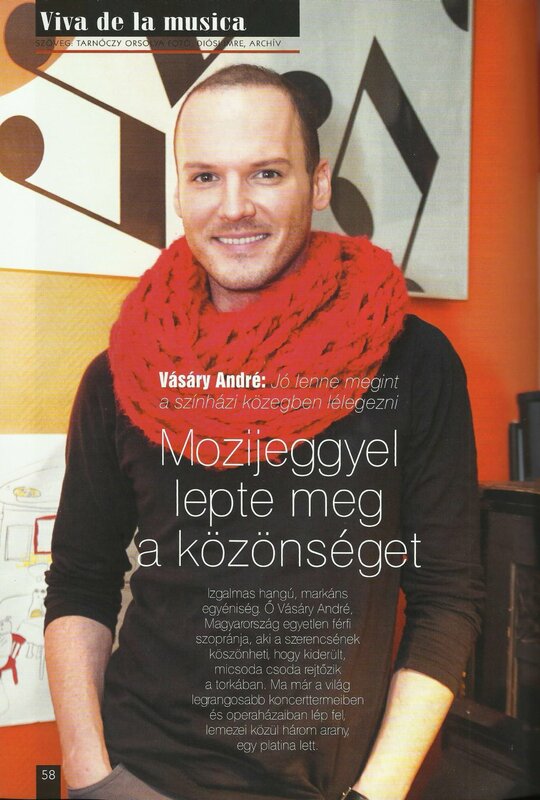 He is the only one male soprano singer of Hungary so far: André Vásáry. Why is it so special if someone sings the soprano lage while being a man? It is just because there are only a few people all over the whole world being in possession of this kind of ability. If you know the Queen of Night aria from Mozart’s opera titled The Magic Flute, you might exactly know what we are talking about. André is able to sing it perfectly. 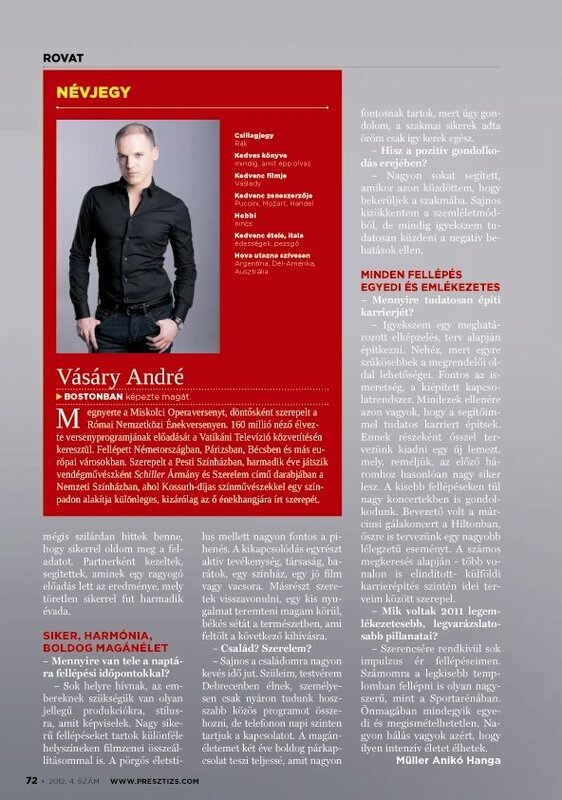 We have interviewed André Vásáry male soprano singer, the owner of one platinum and three gold records in the middle of the rehearsals of his concert titled Hommage to Women that is going to be held on the 10th March in the Ballroom of Hotel Hilton. In this gala concert presented on the occasion of the Women’s Day André will go on stage together with the Hungarian Virtuosi. Bravura airs, chamber orchestra pieces and crossover melodies will be intoned in the event. 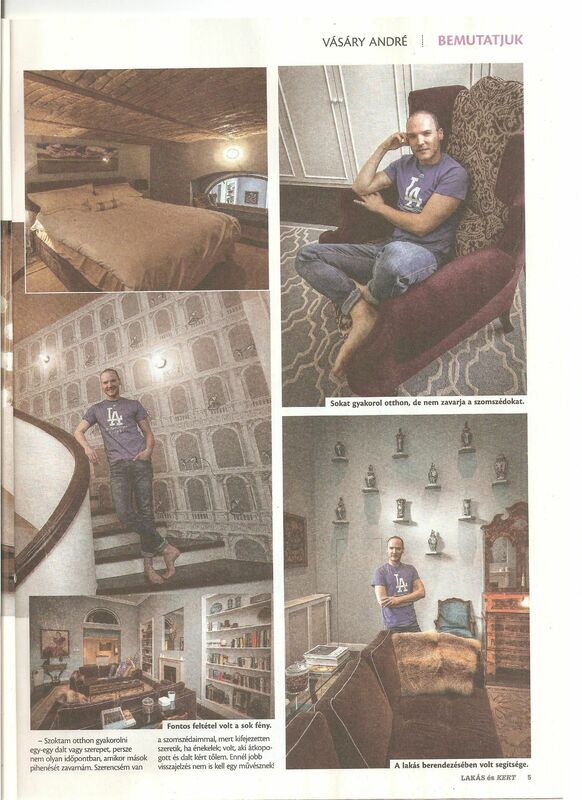 The singer with an extraordinary voice has lived in this downtown flat for five years. There are numerous coffee bars and restaurants nearby giving special impression to the surroundings. The atmosphere of the old civic apartment has seized André for the first sight, so this is the place where he is able to have some rest to top up after a performance or after a full scheduled day. André Vásáry male soprano singer being proud of one platinum and three gold records established his present popularity with more than 10 years of hard work. He trained himself in Boston, won the Opera Contest in Miskolc and was finalist in the International Music Contest in Rome just to specify some of his activities from the beginnings. We had a conversation with André about his last year, about the city and about his future plans. I have already had lots of conversations with André Vásáry, and wrote articles about him. It is always a great pleasure for me as he is an open, positive and thinking personality. And an extremely talented one. He has a voice that - if he is not just born here - would have spread all over the world with huge perspectives. Nevertheless he has no reason to complain: he regularly gives concerts in our homeland and abroad on high-level stages. 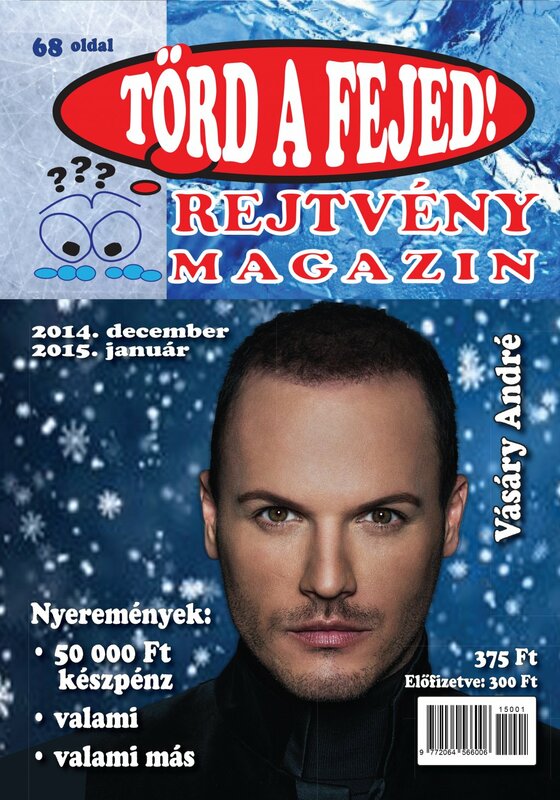 On the 25th December André Vásáry, the only male soprano singer of our country performed a charity concert in the Reformed Church in downtown Miskolc (in Kossuth street). 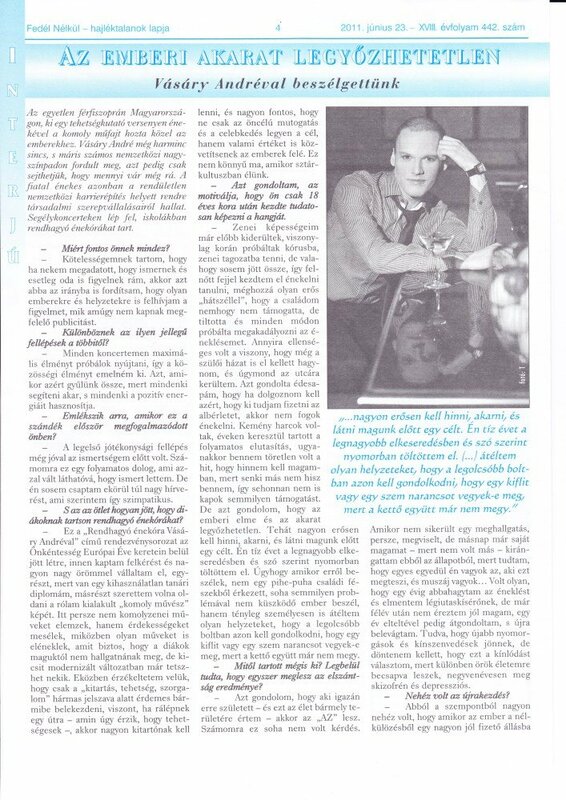 After this period crowded with performances in December the artist gave an interview to our paper now just to inform us about one or two curiosities from his last year. Let us see some best ofs. 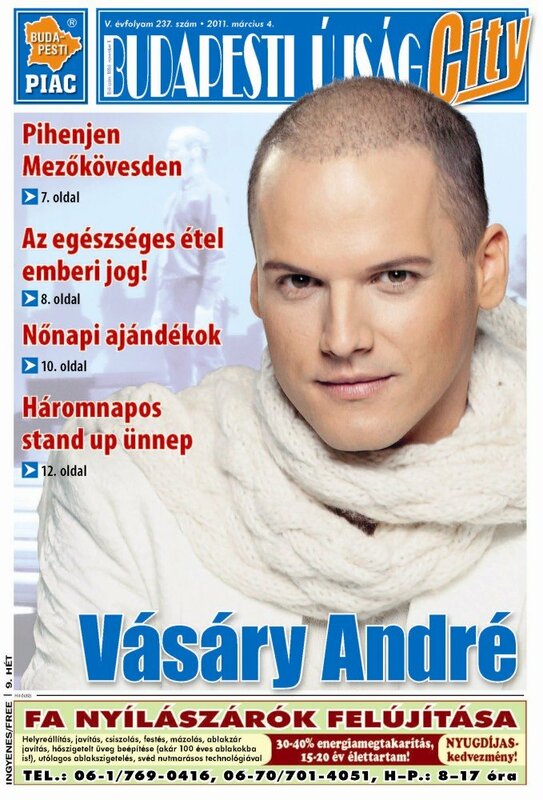 The only male soprano of Hungary, the star of the Hungary’s Got Talent Show of two years ago, is at last in anchorage now. His professional career is nicely forming and his private life has also taken a lucky turn: he has found the very partner, who is really the right one for him. The newfound singer of the talent show has recently taken part in a romantic journey in Portugal with his loved one, about whom he reveals some more for the first time now. The new season starts again at last! :) Not only in the National Theatre, but in concert life as well. I am eager to meet you again! Just follow the Concert menu point, as it is refreshed over and over again with new items! 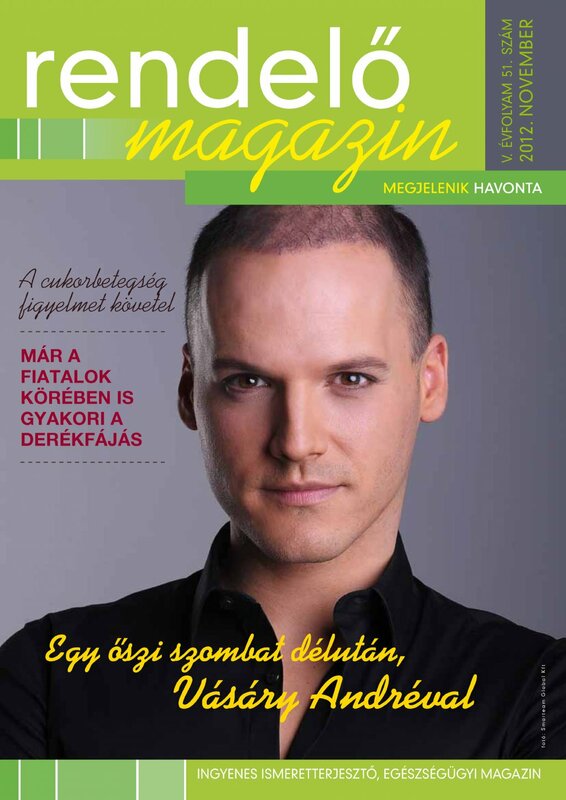 A truly unique man, he is Hungary’s only male soprano singer. There are not many people in the world with a voice like his. We can be justly proud of his successes. André Vásáry is an extraordinary man. On hearing that many may say: oh sure, with such vocal gifts he has what else he can be but extraordinary. Vásáry however is considered to be unique not only because of that. His colossal carrier is the result of such efforts which a simple spectator would not even assume of the moderate, elegant and sophisticated artist. The lover of the Italian and French fashion does not let out his voice in private life and loves the landscape in Vas County and is found of the English humour. 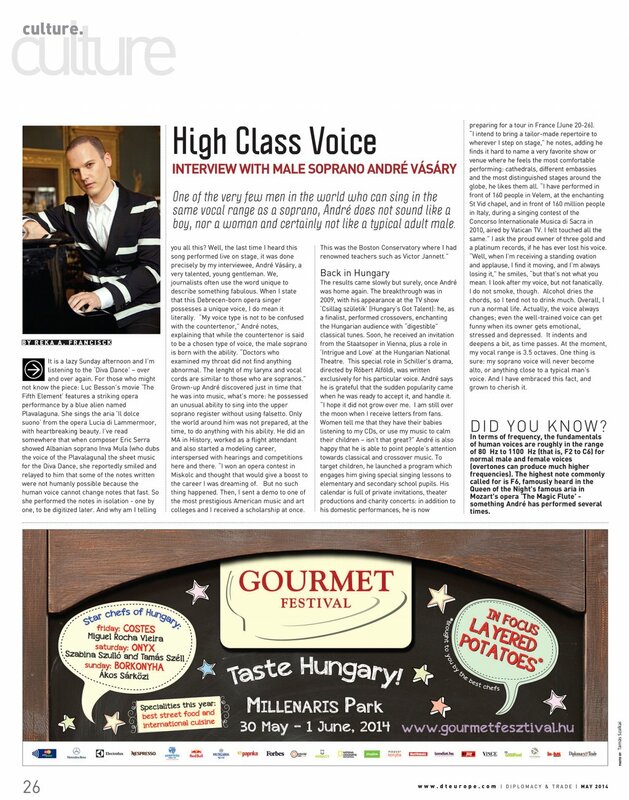 André Vásáry is an intelligent, and elegant singing artist who is sensible to the world and, as it turned out, is an excellent interviewee. This conversation was made with him after his chapel-concert in Velem. How special the chapel concert in Velem was and to what extent, referring to the PA amplification and to the location? I am in the lucky situation I think, that I can always perform on fantastic places. Most of my concerts are held in beautiful surroundings and the St Vid chapel in Velem was not an exception either. It was already on the way up to the chapel when we had already spotted that it was situated just on the top of a hill. Even the picture we saw than had an unbelievable atmosphere. On arriving there I wondered how wonderful the sight, and how unique the position of the chapel was. It caused a great pleasure to me which could be heard from the concert as well. The concert site, its location and atmosphere always have an effect on me, and on the audience as well. I was very satisfied with the organization - a very professional team made the PA of the concert (Mispro Production Agency), so it remains a very pleasant memory to me. What do you think of the acoustics of the little chapel? What was the reason that sometimes you sang with microphone, but sometimes without it? Basically I am a classically trained opera singer, which means that I always sing without microphone in the National Theatre and in the operas. But I use microphone for light music, because singing it needs quite another temper and phonation. In a light music piece I most likely do not sing with such a volume and techniques, than in an opera aria, as I have to attain much more intimate and finer sound. But this is to be done with microphone as the music; the musical base would be too loud to sing on it without microphone. In an opera aria – which is specially written that way and has to be sung with a special technique – I am able to top the musical base, so there is no need for using a microphone. You have prepared for the concert with a repertoire harmonizing with the spirituality of the place and you received storm applause at the end of the performance. Do you see any difference between the acclaim of the domestic and the foreign audience? Do you think the foreign audience to be more expressive, more shouting and roaring, more „feet-drumming” or are the Hungarian concert visitors also able to make a freer, disengaged applause? The domestic audience knows me already; they know what they may count on when I sing. It is not a typical behaviour of the Hungarian audience that they are clapping in during a song, or shouting „Bravo” at the end of it (the writer of these lines did it though). What is typical however that they listen to the song and reward it at the end with an enthusiastic applause or a standing ovation at the most. As for the foreign audience – either in Germany, Italy or in the USA – the loud cheer is an absolutely proper reaction even in the middle of a song: for example when I get to a part of high pitches, they start to applause at once. It was very strange at the beginning, but after a while I had become used to it and I adjusted to it. That means I like when they clap in or the audience express its feelings during the song – as it happened last time in Vienna when I sang The Queen of the Night’s aria and the audience clapped in the middle of it, even if it was disturbing a bit, because it was a difficult aria I had to concentrate for very much – but I am also very satisfied with the heartfelt ovation of the Hungarian audience at the end of a concert. We have the classic picture: the singer lets out his voice in the bathroom. How is it with you? Clearly speaking: where do you rasp your throat? Where do you test it? Where do I sing at home: in the bathroom or on the kitchen? That’s a question journalists always ask me. I very rarely sing at home the way you imagine: preparing to go somewhere and just start to practice. I am in the lucky situation that my work is my hobby as well. I am absolutely able to gratify my passion, the music and singing on the stage. In private life I rarely let out my voice, if at all, I always do it very moderately. When I practice the scales I do it on full volume, but I am lucky with my neighbours: they love me and accepted that this is my „training”. However I always make sure to do it in an affordable daytime not to disturb anyone’s rest. How about the happiness – satisfaction – harmony trio? I think we have to strive for happiness, but it is unnecessary to pursue the perfect happiness: it is no use to wish a big wholeness where everything is square and fantastic and so I am happy. Personally I try to find happiness in small things and I always warn myself how lucky and happy I am in a certain situation or when I am not quite successful in something. Nevertheless I am a persistent discontented character, so it is a hard work for me to pay attention to this, though I tend to handle it much better now. Dissatisfaction is always there towards me as well, and I am able to become easily upset on a concert if something does not go the way I preferred. I am really a perfectionist not only with myself, but with all those in my circle, so I also expect it from those I work with, or who work for me. Of course it causes dissatisfaction sometimes. I just had a talk with an acquaintance of mine referring that the maximum can be different for people, everybody has a limit of his abilities, so we have to be satisfied with what we receive from our mates, or from those who are cooperating with us. And harmony is perhaps the most important from the trio you mentioned. If you are in harmony with yourself and your surroundings, you have a greater chance to become happy and satisfied. Do you have some sphere of thoughts or idealism in the centre of your interest you are dealing with now? I have started to deal with spiritual and esoteric matters recently. Not too deeply, but I think the world can be repaired only by us. Energies are very important: these are the invisible things manifested in trifles. I do not believe that I get up in the morning and decide to be happy, satisfied and harmonic from that day on, as the world is like this around me, but we have to mend ourselves and our surroundings with small steps instead. I have just been thinking on the ego these days as the profession I make is very egocentric. It is always about answering challenges, and radiating a positive picture. After a while it can be dangerous, because you get under the effect of your own ego and start to deal with it all the time. I feel myself lucky because my family and my professional and civil circles of friends make me move out of these lines of thoughts – and from under the effect of my ego. Besides, positive thinking is the main element of my life, although it is a well-worn and commonplace idea: it seems to be easy, but it is very difficult to break through the wall to make it a true conviction. What do you consider to be the most important element of your life style and your vitality in your everyday life? By all means the positive view of life I have just mentioned. I do not hide that I am very sensible. It is interesting that those who know me from the stage see it and say that they totally understand it, but those who know me from private life do not see too much of that side of mine. It is important to confine sensibility and keep the proportions. Do you prepare for some surprise program still this year anywhere in Hungary or in our direct neighbourhood in Vas County? I am a lover of Vas County, I really mean it! Both the landscape and the mentality of the people here is unbelievable. On the way here and back I went all the time into raptures about the natural beauties and about the people I had got in touch with. It would be a pleasure to me to return, but unfortunately there is not another concert planned in Vas County this year, but I hope to receive invitation again. But I am especially looking forward to the Christmas period, as my album titled Feast – which gained the platinum status – brought me fantastic experiences last year. Although I am in full anticipation for the Christmas concert tour which is under organization, such a great surprise program as we had last year in the Congress Centre for the premier of the Christmas album, we do not plan now. Well, this is one of the most difficult questions. I would prefer to combine them! It depends. Both are different. The chapel is a very intimate place I can not think of anything better for a Christmas concert. But for an opera or a song recital the concert hall fits better. In my case, definitely the soprano. Hungary’s Got Talent Show or Fábry Show? You are very cruel… (laughing). The whole country has got to know me from the Hungary’s Got Talent Show, but Sándor Fábry helped me a lot, so I can not decide in this question. English humour or French charm? Within less than two years the whole country has got to know André Vásáry’s name and his extraordinary voice. Since the Hungary’s Got Talent Show in 2009 the male soprano singer has recorded two CDs and is a regular performer on the concert stages. The young singer experiences the uttermost intense, unworldly and touched moments in the last months of the year. 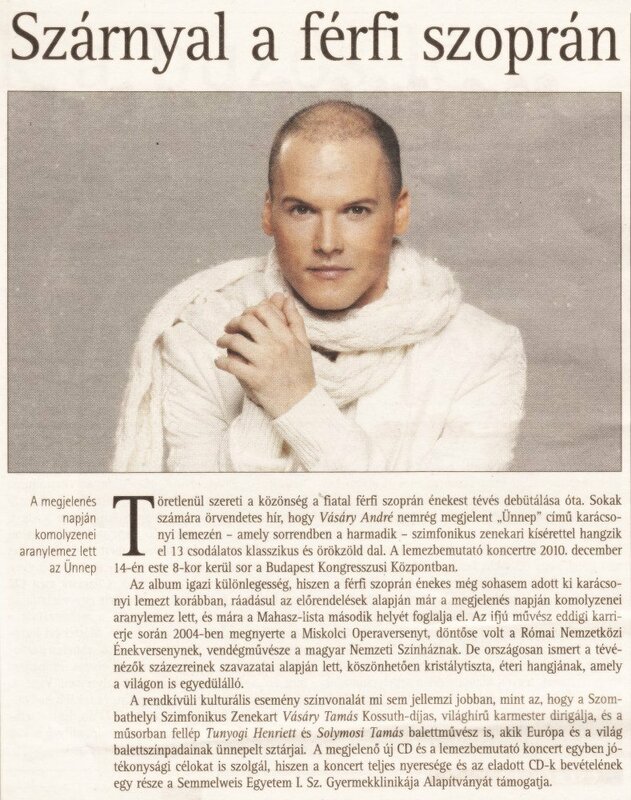 Our male soprano singer was brought really close to us by the Hungary’s Got Talent TV show in 2009, although at that time he had already been known abroad. Many of us know about his artistic carrier by his theatrical and concert appearances and because of his one platinum and his two gold records, but I would like to introduce him by his personal manifestations and asking him about his private life. How can you find time for the many acts of goodwill, notably the aid concerts, the school lecture series and the propagation of the environmentally aware life style need? Everybody has time for all those things he/she would like to do. Taking account of my time and engagements I try to stand by all cases I am able to agree with including calling the attention for homeless people or even to give „irregular singing lessons” for students. The pupils know me from the talent show of the television and in the beginning they are always surprised to hear me chatting in an informal way, not in a teaching style, but just telling interesting tales instead. This way they can also behave much more naturally and loosely; they can ask questions and they are rather getting acquainted with classical music by this. Your excursion into pop music aiming a wider circle of the audience was also successful. What form of acknowledgment is the kindest to your heart? Obviously the moral and the financial acknowledgment are both important as you must be paid for what you are dealing with. But it is very good to hear if my performance receives enthusiastic applaud! What do you consider the most important to tell about yourself in order to make people more acquainted with you besides endurance and diligence which are indispensable in your opinion? I regard myself a complex personality. Basically I have a positive attitude to life and I feel myself very lucky, because I received everything from life I had preferred to get. What kind of a child was André Vásáry? It was a pleasure to read that you have a happy private life. I wish you from the bottom of my heart to go on with it like this forever. The performance of ANDRÉ VÁSÁRY crowned the national holiday on Saturday, the 20th August in Sárbogárd. 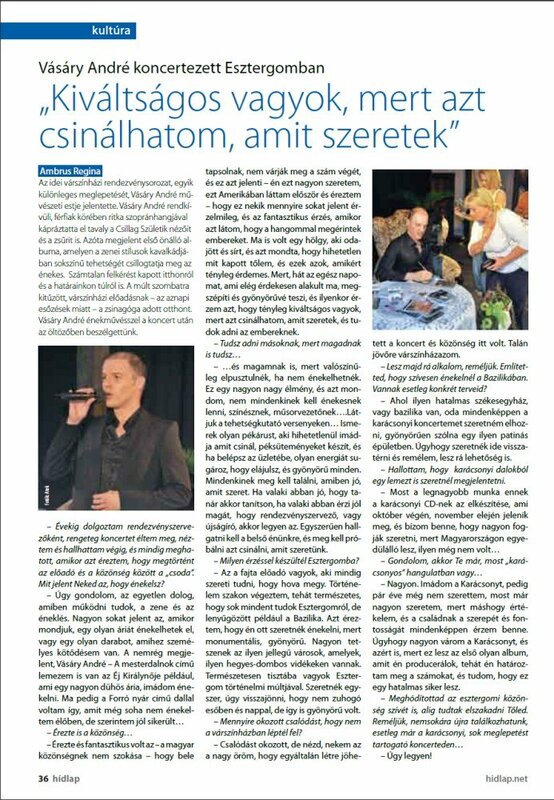 The only male soprano singer of Hungary flashed his exceptional gift, notably his pleasant voice in different styles and tessituras in a one hour concert on the stage of the cultural centre. André Vásáry appeared and became widely known in the circles of the honoured public in a television talent show. His carrier as a singer however has started rather more previous to that; the media just gave full swing to his professional orbit progressing anyway fairly upwards. 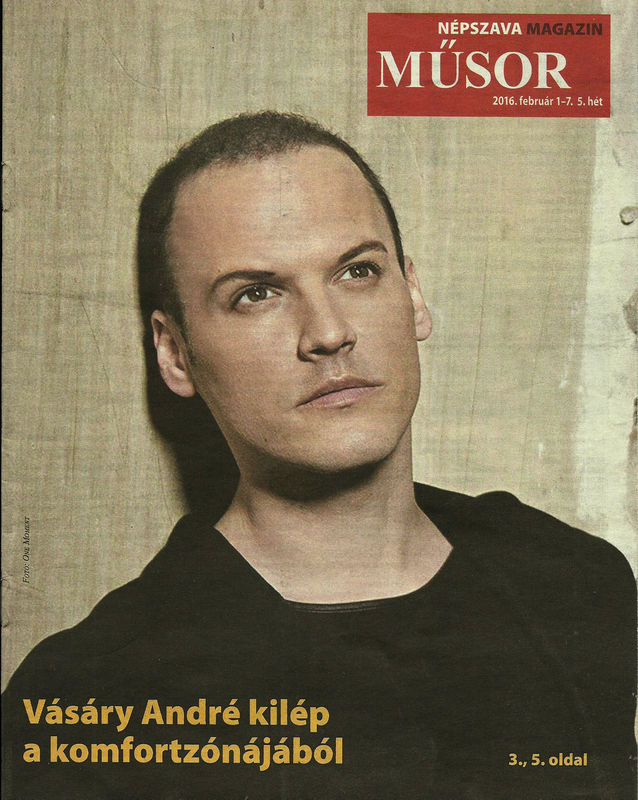 The interview with the artist was made following his concert in Sárbogárd. 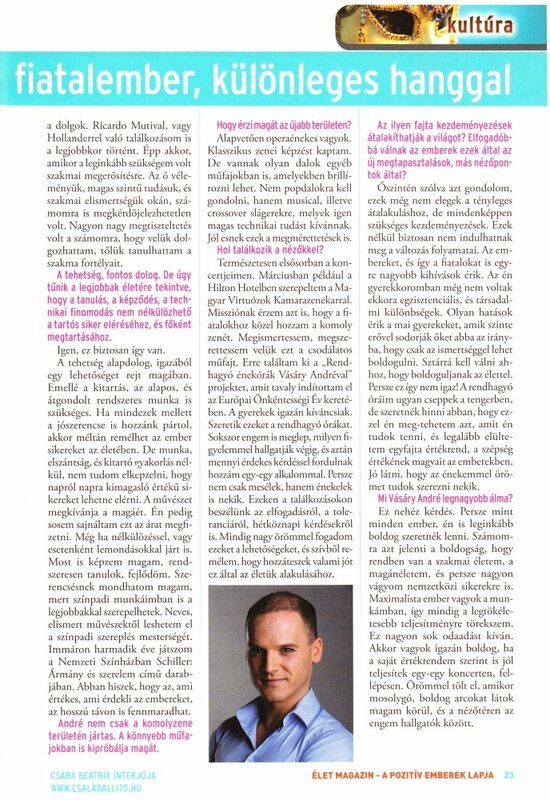 An interview by Virág Hargitai Kiss. André Vásáry has always protected his privacy from the press, so he was always reluctant to speak of his partnerships when he was asked about it. But now he is so happy, that he was talking about his sweetheart with pleasure. He feels now that he is at last able to provide his real self to his loved one, who is his companion in everything. - Why has it become such an important case for you? - Just because I have been given to be known and people may even mind what I say I feel it almost my duty to be grateful for that with calling their attention to situations, fates or even people receiving not too much publicity. It is not a burden to me, not even an effort; it is my pleasure if I can help. - Since when have you been taking part in such initiations? - I had my very first charity appearance long before my becoming known, at a time when nobody had known who this André Vásáry was, but my musician acquaintances requested me to perform something on occasions like this. For me it is a non-stop, continuous activity which has become seen by my reputation, but I have never made too much fuss of it. - Have you also been asked for the school series titled „Irregular singing lesson with André Vásáry” also by your acquaintances? - This program was organized within the frames of the „European Volunteership Year”. The request came from there and it was really my pleasure to undertake it. In the beginning they did not know what they prefer in connection withe me, although it was cut and dried that I would have to sing. And than the idea came to me that I have an ineffective teacher’s degree…. - … what you might utilize right now? - That’s right! They knew that I could find the connection with the young ones well and easily, and I knew that an image of a „serious artist” had been formed about me, so it was time to change and loose it a bit. I am very glad to have this „project”, because the lectures are interactive and run in very good atmosphere. - Are the series held all over the country or only in the capital? - We have so far brought the program to elementary and secondary schools in Budapest. Unfortunately we had to select them as I have other kinds of requests, too, but we would continue with the series from the next school term on. But you do not have to think now that I analyse Bach and Händel pieces and sonatas during the lectures, but I tell them curiosities instead and I sing such songs in between what they won’t listen to otherwise by their own initiation. But in my version, in this more modern way they might even like them. Meanwhile I make them feel that only under the triple password of „perseverance, talent, and diligence” is worthy to start anything, but if they step on a line – on which they think themselves to be gifted – they have to be very persistent. And it is also very important not to be driven by the autotelic exhibitionism and the celebrity behaviour but to mediate real values to the people. It is not at all easy today, when we live in star cult. - And what do the students have on their minds; what are their questions refer to? - I have observed two things profoundly: the first one is when I speak about tolerance. About the situation that being mocked because of diverging from the others, from the great number of average people – by weight, hairstyle, skin colour, religion or anything else – might be very painful for anyone. I call their attention to look for examples from their own lives, as everybody might have undergone situations of being offended undeservedly, I am sure. I always experience very great silence at this moment of the lectures. I have been working in theatres for years, so I know the differences between silence and silence. This is the kind of silence when you feel that my words sow the seeds into their minds. It hit them badly as the teenagers are very critical most of all with the others. On occasions like this I used to mention my own examples, though I have never been hurt because of being a male soprano singer, but I also received different remarks and I had to harden myself in a great deal to go through with my career or rather to be able to start it at all. That is what I attract attention for and the questions are very much varying. The other thing is that many students prefer to become television anchormen and ask my advice this concerning – though if they asked me about singing I could have answered much more easily – and I used to say that learning languages, acquiring a diploma, the process of studying in itself and starting a career from the very beginning are indispensable factors. I just believe that I was able to achieve this and I am able work in this line of profession now is just because I also started there: I had gone to sing for free for a while. I started from the lowest level and not long ago I had a stand-alone concert in the Congress Centre with the accompaniment of a big orchestra. Only a few people is able to omit steps and arrive at the top at once, as it can reveal itself in his/her personality development as well. - And what about the fact that you started to consciously train your voice as a grown-up, after your age of 18? - My musical abilities have turned out long before that: my teachers tried to get me into choir and musical classes, but somehow they have never succeeded. So I started to study singing as a grown-up, facing a strong headwind, because my family did not support it, what’s more, they even prohibited and tried to withhold me from singing. My singing teacher did not fully trust me either and all these created such tensions that it was time for me to leave even the parental house when the relationship with my parents stopped working any longer. My father thought that I would surely give up singing if I had to go to work in order to pay for a room to rent. These were strong fights going on for years between us, the rejection was permanent, but my faith that I have to believe in myself was unbroken for all these times, because there was no one else to trust me. - But what did help you keeping faith in yourself after all? - I think that if someone was really born for doing some task – and I mean it for all fields of life – he/she would be able to do it finally. For me it has never been a query. When I was not successful on a hearing – though I was looking for the reasons and answers a whole day long afterwards – it was me, who had to pull myself out of this condition as there was no one else to do it. - And what about your friends? - I realized that they do not even understand what it is all about, when they put me the question: „André, are you still going on with singing?” At that time it made me very angry, but later on I figured it out that I could not be angry with them as they evaluated it on just another way round. For me it was quite natural that I had to go on with singing. Even if nothing happened after three years of attempt I was shattered when I was not successful on a hearing, I felt sorry for myself for a while, but then I had to pull myself out of this mood – as there was no one else to do it – because I knew that I was the only one to do it after all, it was just a must. - Why did not you finish it? - I just thought it over: if I stayed for four years and finished it, I would get out in such a way that I might not get any chance on an international level. So I came home for the big stinking nothing. There was no need for me anywhere. But I started to build up myself. - It happened that I had given up singing for a year and went to work as a flight attendant, but after half a year I started to have a discomfort feeling and I also met the signs one by one. - Even if you were able to deceive yourself you did not succeed to do the same with your teacher. - I was surprised and thought it over and decided to start it again. On being conscious that new wretched existences and tortures were going to come, but I had to decide: either to choose this struggle or I would be deluded for my entire life and become depressed and schizophrenic by my age of forty. - And what was the restart like? 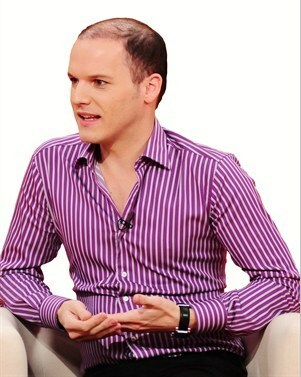 - It was very difficult especially from the financial point of view. Just imagine the situation: you get into a very well paid job from deprivation, so it really needs an intestate fortitude and spiritual power to change a payment of more hundred thousand forints to nothing. I brought again a new decision: quitted my job from one day to another. And I started to look for another one. With a diploma and language exam I had jobs – though working is not a shame, I know – which didn’t suit my profile or better to say they were „out of perspective”. I also looked for the best teacher – who to top it all lived out of Budapest, so travelling caused me another problem – and started to train myself even harder than before. So till the time I got to the Hungary’s Got Talent Show I received performance requests on such level that I was just ducking my head for a while. Just the day when it turned out that I had been selected into the contest, I had to choose from among three appearances. The invitation of the Staatsoper in Vienna which is one of the most significant opera stage was an unbelievable honour to me. But just keep in mind, at that time I had no agent or manager, I only sneaked into a hearing and I became the one selected. And the Hungarian National Theatre also offered me a role. I had only one day to make a choice from among these three possibilities. I think I made a good decision by choosing the Hungary’s Got Talent Show and the National Theatre. After the television’s Talent Show my life has changed entirely. - Hungarian people are regarded not being too open to novelties. But I experienced my first standing ovation in the sorting program of the Hungary’s Got Talent Show and it was more than 2 minutes long. You could not see it on the television, but it was a fantastic treat to experience that they are open after all. If they see that it comes sincerely, if they see the work invested and the talent behind, they really appreciate it. I think it is the same all over the world. Sincerity is the best entry. It is the most important thing on stage; the audience does not like too much if someone is mannered or takes up a role. I have already learnt that even at the beginning of my volunteership when I was only a no-name performer for free. 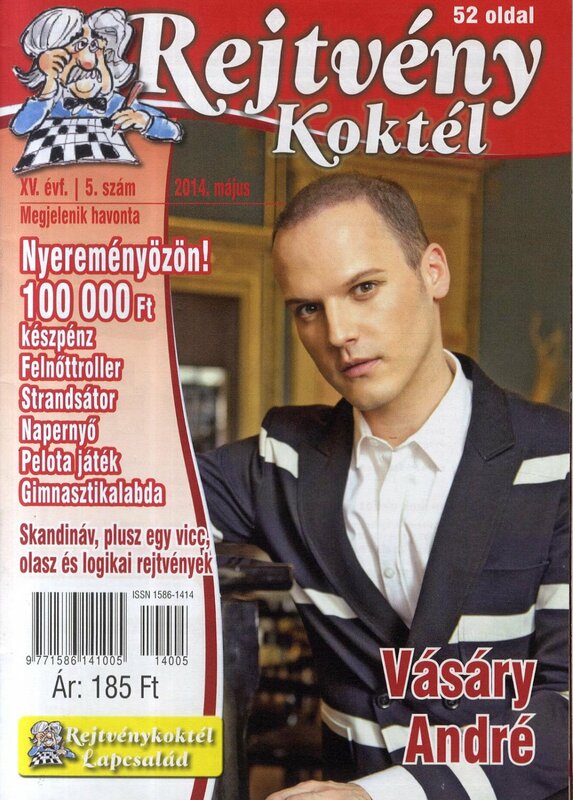 He is the only male soprano singer in Hungary; his lage is very rare even in the whole world. 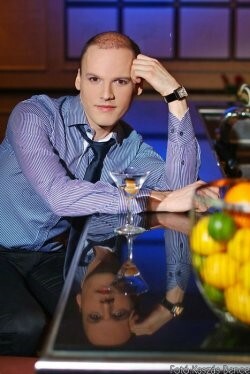 He is the winner of the Opera contest in Miskolc, and finalist of the international singing contest in Rome. He could be seen singing through the Vatican TV by more 160 million people. He received request from the world famous Staatsoper in Vienna and was invited to more international competitions as well (to Paris, Graz, Vienna). He participated in the hearing of Ricardo Muti, who offered him a role. He studied in America with a scholarship and then he continued his studies in Europe. In Hungary he played roles in the National Theatre and in the Pesti Theatre and he is a regular participant of our festivals (e.g. Budapest Baroque Festival, Hungarian Farinelli concert series, etc.) 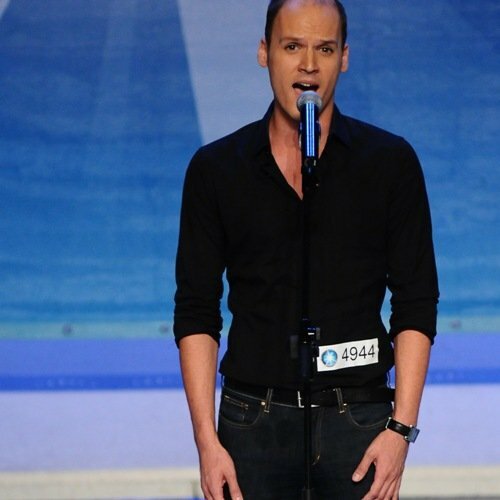 The nationwide reputation was brought him by the Hungary’s Got Talent television contest. The photos were taken by Bence Kaszás. Suggestion: more photos and videos can be watched by clicking on the following link. André Vásáry held an irregular singing lesson in the Hunyadi Mátyás Elementary School with a great success. The opera singer is going to provide similar programs including the one hour lecture accompanied with photo shooting and giving autographs in other schools as well. The first station of the program series was held in this school situated in Karikás Frigyes street in the 13th district. We had this conversation with André Vásáry in the City Concert Hall of Zalaegerszeg just before his concert recently. He appeared in the previous series of the Hungary’s Got Talent Show, but his singing career had started much earlier. The sentimentally pathetic and thrilling tunes of the Once upon a Time in the West in André Vásáry’s performance have permeated us forever. The voice of this young man is extraordinary; there are altogether three similar male sopranos to be found in the whole world at the most. He started his musical studies in Debrecen, but in fact he did not train himself in institutionalized frameworks here at home. - My abilities in music have turned out early, nevertheless I started to deal with singing and learn it seriously only at my age of 18. Meanwhile I graduated in the teacher’s college and took a master’s degree on history. When I won the opera contest in Miskolc, I thought my career would start up. But no such thing happened. Then I sent a demo to one of the most prestigious American music and art college from where I received a scholarship at once. On finishing his studies in Boston, André Vásáry returned to Hungary. He started everything again from the beginning: he regularly visited hearings and competitions. The results came slowly but surely, and even at the time of the Hungary’s Got Talent Television Show he received an invitation from the Opera Houses of Vienna and Budapest, and he also got a singer’s role in Schiller’s drama titled Intrigue and Love played in the National Theatre, directed by Robert Alföldi. - For me it was quite natural that I own a voice like this. When I realized how particular it was, I understood at once that I would make a career with it. However for a long time it seemed to me that my extraordinary voice is much more a disadvantage than benefit. - They have not supported me, but do not by all means think of loud quarrels between us, when I speak of it. They rather tried to force me not to sing. They have quite another attitude to this as there has never been anybody else in the family gifted with artistic talent. I recommend to all those who feel some kind of vocation in him- or herself and who receive positive feedback from others, that it is worthwhile not to give up but continue. Since then, my relationship with my parents has been settled; we managed to arrange it still at the time of the Hungary’s Got Talent show. However it was a long process, because when they were ready to open to me, I closed up a bit… But I think forgiveness is an important virtue. I tried to re-evaluate the situation, and I found, that I had made lots of mistakes as well. - How do you protect your voice? - It is advisable for me not to speak too loud before concerts… I do not smoke and I run a normal life. I do not want to get hooked on my voice; however it is important for me to keep it under regular control. - Do you think it can still change? - Does your high range of voice influence the repertoire you are able to sing? - As for classical music I can sing almost everything from the baroque era, but a good many pieces present itself in the concert literature as well. Furthermore, it is my pleasure to work in the crossover genre, which is a mixture of the classical and the light music. But just recently I have made an excursion into the world of pop music with the song titled It has never been mine. The novelty of this song is that I perform it on my male voice. He has published three CDs so far, the Christmas one gained the Platinum status. He is constantly on stage, in summer he is expected to open-air concerts. The other day he sang in the Liszt-program on the Dome square in Szeged, which he considers to be an exceptional possibility. He says, if invited, he would gladly take part in the Eurovision song contest, too. These days he gives irregular singing lessons to elementary and secondary school children. He has conversations with the students about the steadfastness of purpose and he even has some words with them about the harmful sides of starship. This program is held within the frames of the European Year of Volunteership. 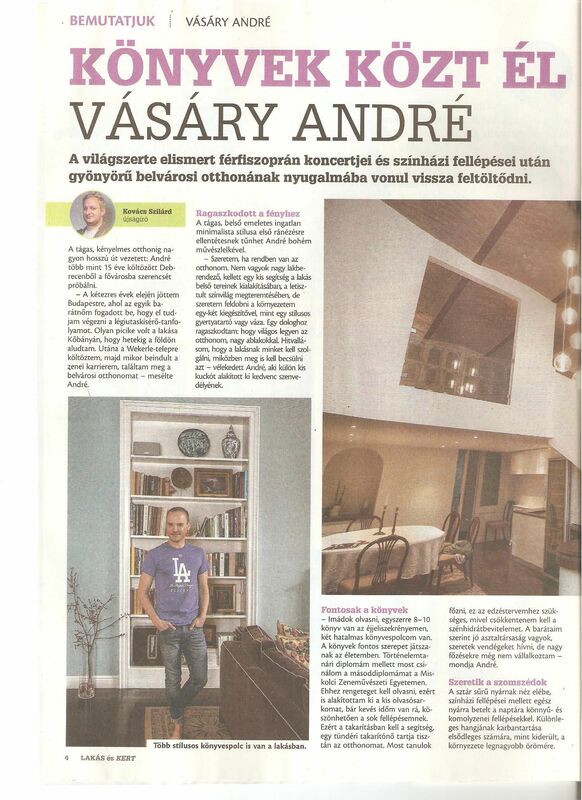 As André Vásáry says, if he receives invitation, it would be his pleasure to visit schools in Zala county as well. 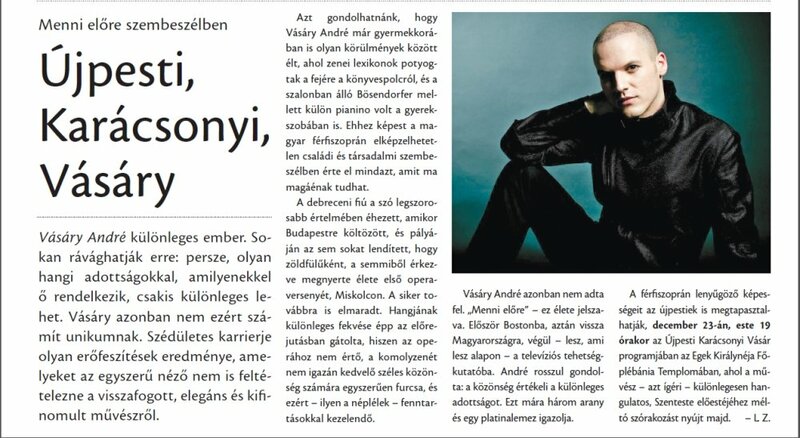 André Vásáry’s (29) new song will be quite special from several aspects. The soprano singer who has become widely known in the previous series of the Hungary’s Got Talent show is going to appear before the audience with a pop song! What is this change of genre due to? - I have just caught myself at being always on the go among the genres. After the solemn Christmas album I longed for something lighter. Nevertheless it does not mean the change of style, but it is sure enough that the audience has never heard and never seen anything like this from me. Who has the idea of this new line come from? - We have invented and fabricated the new sounding together with my manager and Zé Szabó. We have been thinking a lot on finding out who would be the best to work with, until we opted for Zé Szabó. He is such an authority of the trade who has already worked behind numerous Hungarian pop singers and musicians. When will the audience hear your new song? - I am going to present it after a fortnight from now in the Hungary’s Got Talent show for the first time, and then the radio stations will hopefully broadcast it as well. I can not reveal too much about the performance yet, but it is sure I won’t be alone on the stage this time. 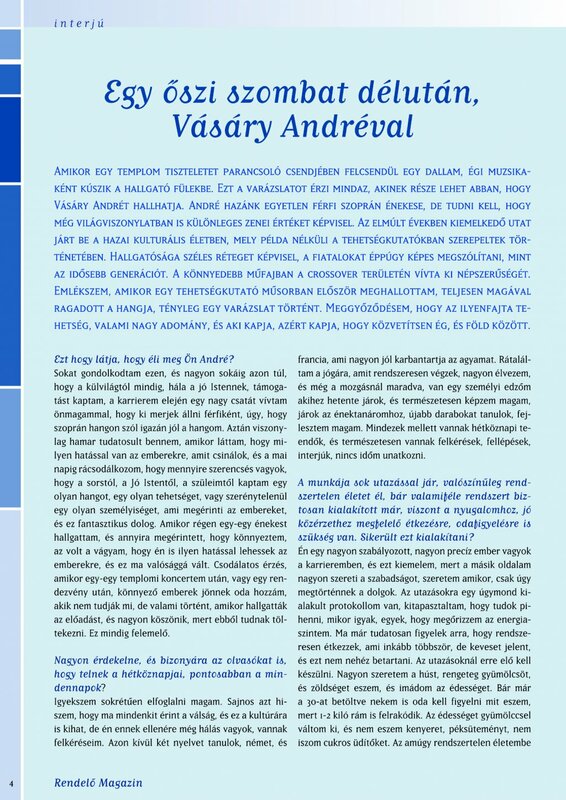 On 28th April the well-known male soprano singer, André Vásáry gave a lecture in the János Xántus Bilingual Teacher Training Secondary School. As it turned out from his story, the singer having extraordinarily high tone of voice was sent to doctor at first, because his teacher could not believe that a healthy young man was able to sing in such a high pitch. In this part of the program series called irregular singing lessons launched within the frames of the European Year of Volunteership, the artist told stories to the students about curiosities of the music history and also of his own career. He said that his particular high pitch of voice was due to nature as his larynx was much smaller than normal and there were altogether three men in the whole world who were able to sing the popular aria from Mozart’s opera, The Queen of the Night. Among the musical interludes of the lecture he sang the Diva Dance hit, which had been in those days the most popular song of the Fifth Element movie. In the course of a musical history overview, he said, speaking of the renaissance music, that as far as the 17th century even the female parts were sung by men, the so called castrated neuters. Advancing to his own career, he called the attention for the dangers of the nationwide reputation gained from the television appearance. „The talent-shows help to start, but afterwards everybody has to fight for his/her own success” – he said. Without real artistic production no one can be able to maintain the quick and sudden popularity. These musical talent shows are good for those who want to present and reveal something of themselves, but who are on such a level that it might become successful. There are many tumbles and difficulties, hence many drop-outs in the musical trade. Only those can remain on stage who are able to stick to their dreams and trust in their future success even in the days of hardship. ANDRÉ VÁSÁRY, AS WE COULD NOT HAVE SEEN HIM UNTIL NOW! André Vásáry is going to show such a side of his talent soon which might not have been so much known so far. 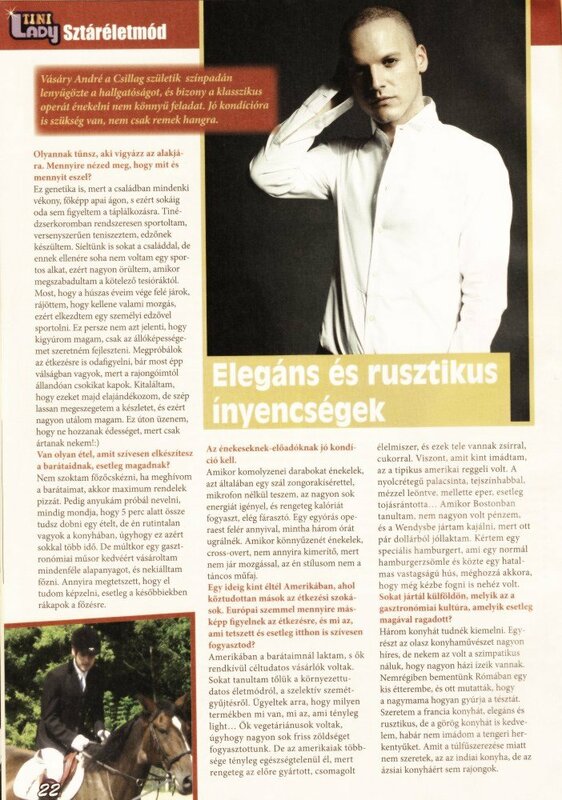 The one and only male soprano of Hungary disclosed that he has challenges waiting for him not only in the classical music, but also in the light music as well. Should the occasion arise, he would even accept the challenge of the competition in the Eurovision Song Contest. - Did you follow the events of the Eurovision Song Contest this year as well? - Absolutely. I have already spotted her in the talent show what’s more, our first conversation was also quite a remarkable one. And previously I have even worked together with her father. To tell the truth, I watched the ESC just because of her appearance, and I also liked the song written to her by Viktor Rakonczai. I think this is one of the best songs of the past years. - And what’s your opinion about the result? - When she qualified for the final, I burst into tears. It is not like me, as I am not at all a weepy type. At that moment I was very happy, but I was not, when it turned out that she finished on the 22nd place. I don’t want to seem too wise now, but when the press started to predict her even for the first place, I was almost sure in a similar result that was realized. Everybody knows how things go and how people vote in this contest. Many factors contributed to this result, it is not Kati’s fault. She provided a 100 per cent perfect performance, and did her best. Congratulations! Nevertheless it has to be seen that this Eurovision Song Contest is not like the one it has been some years ago. - Some people compared the singer representing France to you. What do you think you would also prefer to enter a competition like this? - Such an entry is quite an interesting story here in Hungary, but anyway I would not say no to such an invitation, I would be pleased to show myself. I have heard from many places that I should enter the contest, but there were no official request for that, nobody offered me the possibility. I just learned that Hungary would be among the participants from the announcement saying that our contestant would be Kati Wolf this year. But indeed, I would like to take part in the Eurovision Contest once. I just wonder what kind of an impression I could make by that peculiarity I own as no similar voice has ever appeared in that Contest. As far as I think people believe that “André sings only the operas”, but the French boy mentioned before performed a crossover piece – according to my opinion – beautifully and very well. - Now you are going to show quite a new side of yourself. - Sure. The first pop song of my life is ready. I encourage everybody to listen to it, as it’s going to be a surprise for them. In this song I sing on quite another kind of voice compared to what you are used to from me. - How much do you feel this new style to be close to you? - I used to say that I am an “ideal crossover artist”. The crossover style is a mixture of the light and classical music. I am fond of both: I would not be able to live without any of them. If I had to sing only classical music or only light music exclusively, I would not be able tolerate it. So it is a very good excursion for me, as my Christmas album titled Feast – which earned the Platinum status – contained mostly classical pieces and I started to long for singing something from the lighter genre. Now, when this hit is out, I am going to prepare with all my efforts for my tasks in the classical style. 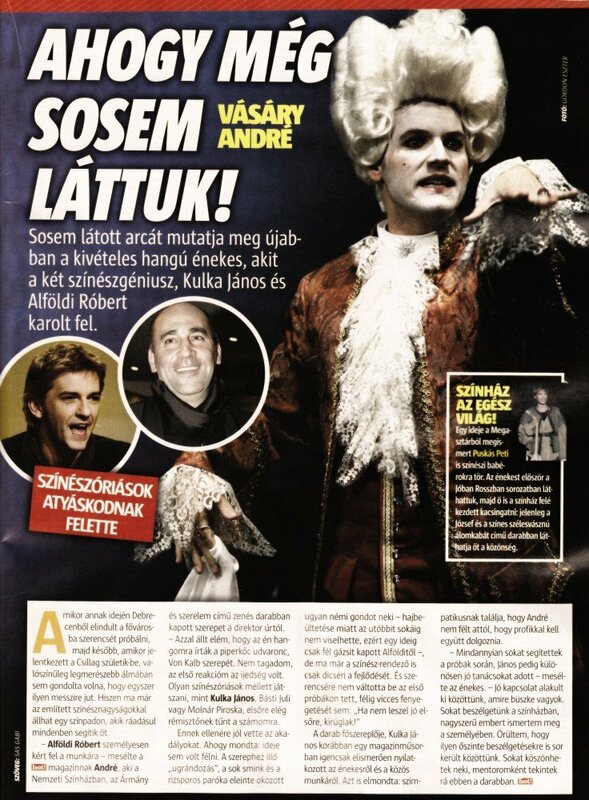 As I have already mentioned, there are news spreading about me, saying “André always sings opera arias”. But my concerts contain light music in 90 per cent so the audience can listen to enough of that as well. I feel very well this way that I can switch between these two genres. It is a very great luck to me. - Do you perhaps prepare with some similar surprises? - I just reveal you a secret. When this song was in the making we recorded two of them at the same time, because we were not able to decide which one was better. This one is a quicker, more rhythmical song, the soup-up or revved up remix version of which I am going to perform tonight in the Hungary’s Got Talent Show of RTL Club TV. The other song is slower, and we also plan to come out with it, but for the summer we have decided to present the quicker version. As for the future I would like to sing one or two pop songs yearly, but of course I continue to work in the world of classical music as well. It has always been my aim and I am happy now as it seems to become realized. - Speaking of the Hungary’s Got Talent Show, you have become well-known by this TV program. In the present series of the Show new talents appeared. Do you have favourites among them? - Mr Joe was my greatest favourite. I was surprised to see him falling out, because we speak of a very professional, “old hand” in the good sense of the expression. 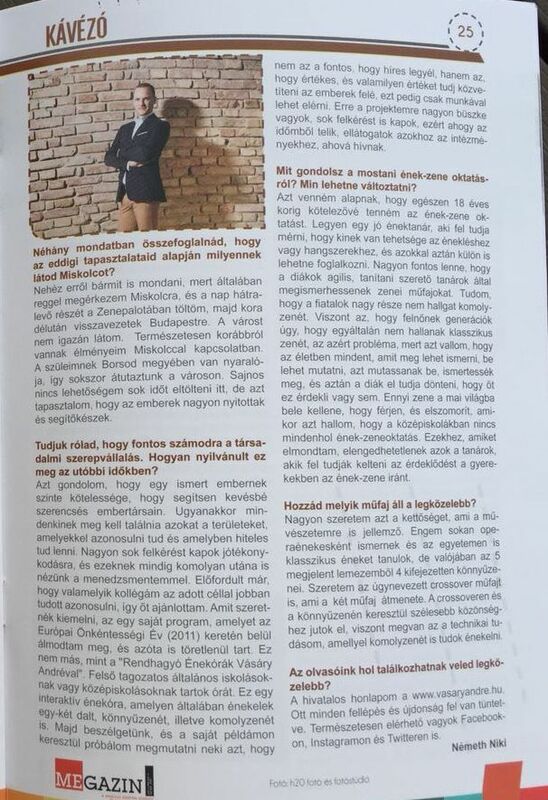 I preferred the performance of Teca Krizbai as well, although I also share the opinion of Miklós Fáy: when she sang her own song she convinced me much more about her great talent, but some of her latest appearances were not sympathetic for me either. So joining to the strict jury I can pick up these two contestants. For the singer of peculiar voice the spring period was all about making a new song which was quite unusually a pop song titled “It has never been mine”. With the composition of Zé Szabó they succeeded to conjure a unique spice onto the palette of the world of light music. 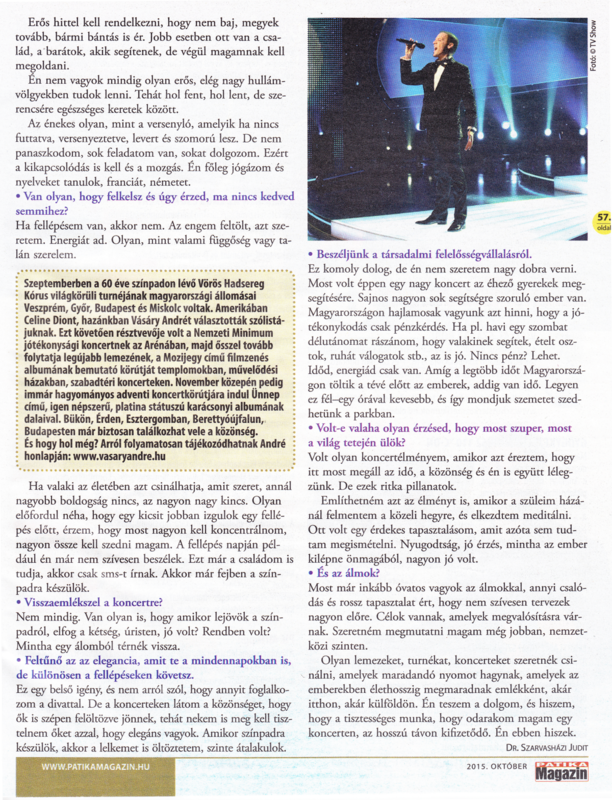 André performed the premiere of the song in the Hungary’s Got Talent Show on 21st May with great success. This time we asked him and his mother about their relationship. As it turns out from their answers André’s mother – just like the audience – follows his son’s career with every one of her heartbeat and considers his steadfastness of purpose which has made him a successful performer by today quite exemplary. People are interested in everything that is special. Emotions in the first place, but even miracles as well. However there are only few things nowadays that we are able to become surprised at… Then there is a young man coming around charming us, as the way André Vásáry sings to us is a real wonder in itself. The special gift and talent is most often not enough for gaining success, a special and extraordinary personality is also needed for that. With persistence, lots of work and with the power of emotions which he wants to share with us. 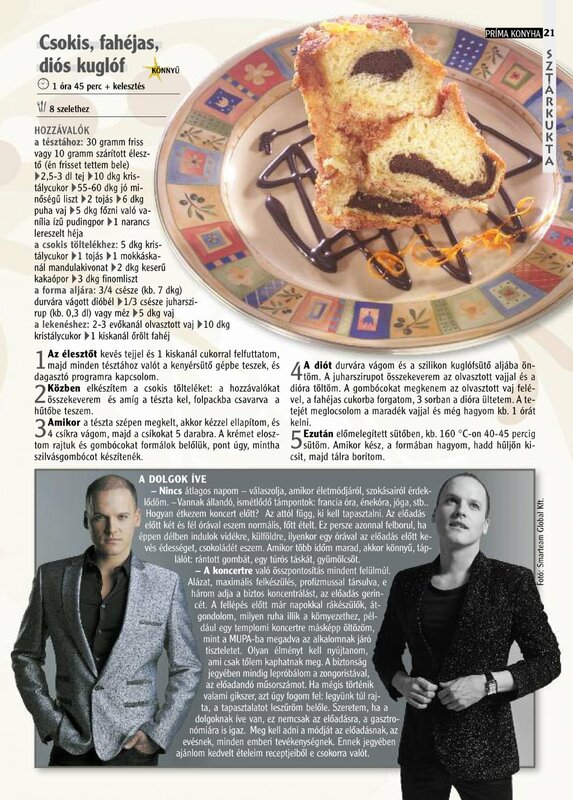 Budapest – I have just received the news, that my album titled Feast (Ünnep) gained Platinum Record! Many thanks to all of you! So now I have both Gold and Platinum Records – the opera singer André Vásáry reported the news to his fans on the popular community site. His unique singing voice and his musical talent has already been discovered in the elementary school. The young man, 29 years old this year, comes from Debrecen and he is the first one in his family having artistic disposition. His parents deal with civil professions: his mother is a book-keeper, his father is an engineer. The way leading to a singing career was relatively straight for him, although in his a teenage years and later, being a high-school student, he also tried working as a model. In the meantime he did not neglect training his extraordinary voice, but he was not excited by the genre of pop-rock: he started to deal with classic music from the very beginning. The turn in his life and in his artistic career occurred in 2004, when he pitched upon a leaflet calling for an Opera Contest in Miskolc. He entered for the contest and won the first prize right there. That was the moment he faced once and for all, that there was nothing else for him but singing. He started to believe step by step that he was really blessed with an exceptionally rare and unique voice. Miskolc was followed by the United States on the route, where he was taught by the teacher of the highest ranked musical institute of the world, the Boston Conservatory. 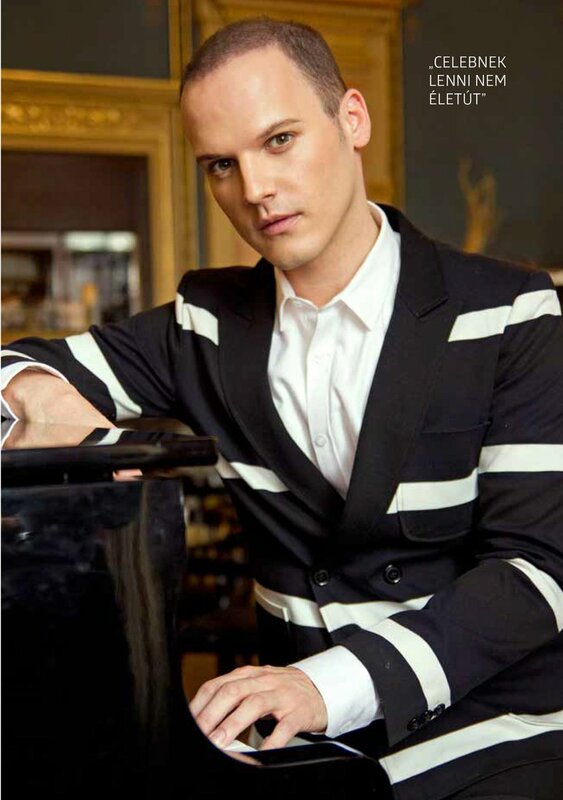 In November 2008 he became a finalist in the international singing contest in Rome (Concorso Internazionale Musica Sacra), after which Ricardo Muti invited him to a hearing. 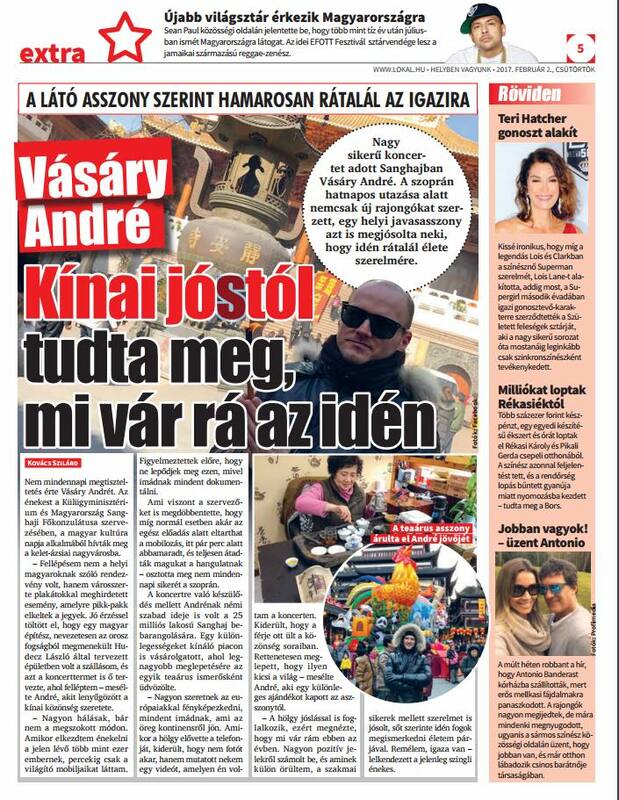 Two years ago, André Vásáry got until the final of the Hungary’s Got Talent competition of RTL Klub and engraved himself into the heart of the Hungarian audience and into the domestic music life. Since then his national, what’s more, international acknowledgement has been ever increasing; he dazzles the audience with his powerful and striking musical talent and individual way of performance in series of concerts. 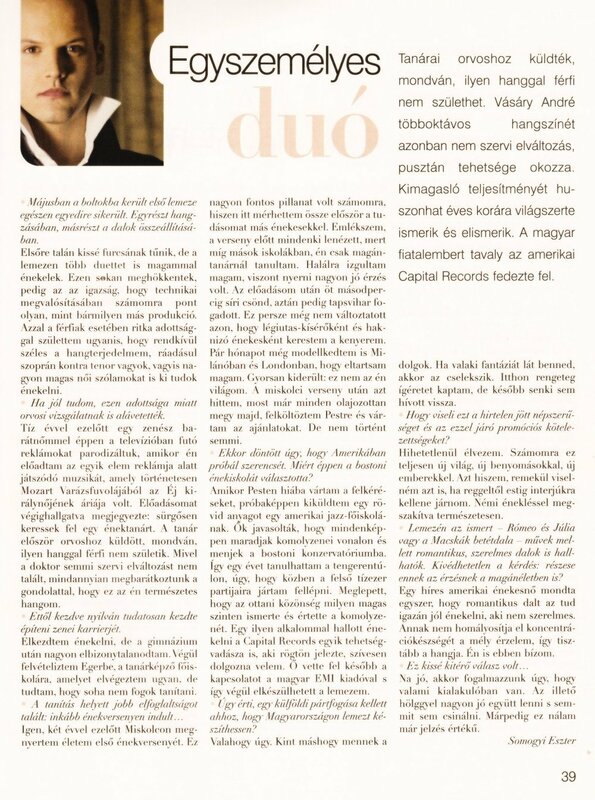 He was even able to win around a world famous artist, not less than Tamás Vásáry conductor and pianist to become his partner on the presentation concert of his third solo album titled Feast (Ünnep). - We cleared it up at once, that although our first names are identical, we are not relatives, at least we don’t know about common roots – they reported. As Tamás Vásáry told us, he undertook the performance on the first requesting words, even his young wife, Henriett Tunyoghy and Tamás Solymosi ballet dancers joined to the presentation concert offered to charity purposes. The world famous pianist conducted the Savaria Symphonic Orchestra of Szombathely participating in the concert. On this night – some weeks after the release of the album – André took over the Gold Record from Ferenc Miklósi, publisher of the album, within festive circumstances. Since then the Feast – including 13 wonderful classic and evergreen songs in 6 languages with the accompaniment of a grand orchestra – has gained even the Platinum Record these days. - The male soprano is really a unique sound – added Tamás Vásáry. This rather rare type of voice, not to be mistaken with the countertenor, has become really stylish in the 17th-18th century. Listening to it without knowing who is singing, one can easily think it is a woman’s voice. The male soprano however is able to sing an even higher tessitura than that being unusually wide. André treats his extremely unique gift rather talented, fine and sensible. In his case nevertheless we are able to feel that the performer is a man even in spite of this unbelievable patch of voice, but don’t forget that he sings the Queen of Night, as well. - This was also strengthened even by Ricardo Muti, with whom I was lucky to work together – remarked the young artist. – I hope and trust that our successful cooperation with Mr Tamás Vásáry master conductor would be continued not only in Hungary but abroad as well. I long for showing up together – the two Hungarian artists with similar names – to the world. But I am aware that I have to grow up and mature for that. 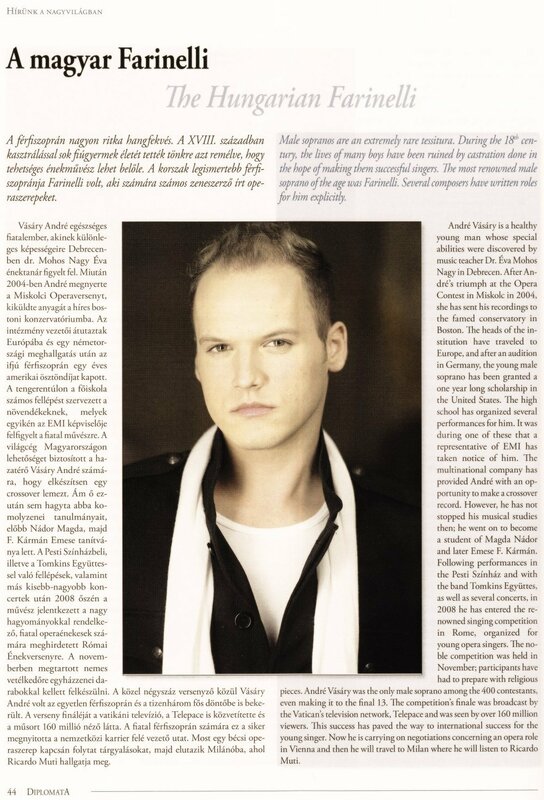 André considers himself an opera singer above all, but as the audience has got acquainted with him not in opera roles in the first place, but in the genre of crossover, he does not want to give that up totally. - Nowadays there are many passages among the types of genres, and it is a great pleasure for me to sing many kinds of genres. And however surprising it is, musical literature is full of pieces written for the male soprano lage. From baroque music to Rossini, there is a rich palette for me to choose from. The performance of André Vásáry in the New Year’s concert with the Dohnányi Ernő Symphonic Orchestra in the Palace of Arts provided an unforgettable experience for many of us: he sang the famous song of the film classic titled Once upon a Time in the West eerily wonderful with a mouth organ accompaniment. The audience celebrated the young artist standing up. 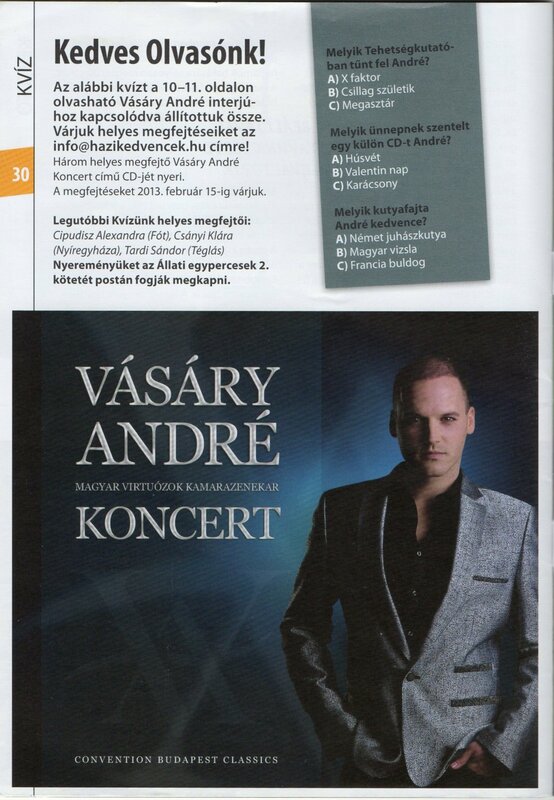 André Vásáry – the only male soprano in Hungary who owns the range of voice similar to the first Queen of Night and the late sister-in law of Mozart, Josepha Hofer by name – has arranged the songs of his third album in terms of the Christmas atmosphere. Apart from the details of the concepts of the Feast however, many other questions have come up to talk about in our conversation. - Being an opera singer is not at all a civil profession even if compared to office works, but your career driving you here has been curly and windy enough: previously you have been working even as a flight attendant. How did you choose singing instead? It is in fact a matter of viewpoint what can be considered to be curly and windy… For me my career seems to be rather straightforward, direct and clean-cut. Singing has always been the first. The whole affair started with the Opera contest in Miskolc, which I won, than I continued my studies in Boston. Because there is very few creativity, openness and supporting resolution in the Hungarian system of music teaching and to say the truth, they did not know what to do with me. Furthermore the interest for countertenors and male sopranos has increased a great deal at that time abroad. Here in Hungary even the differentiation of these two lages is the matter of a debate. I have even been informed once in France, when I specified myself as a countertenor, that I am in fact a male soprano instead, which is an even greater curiosity. - If openness has already been mentioned: how can the talent show in the television be made compatible with the Staatsoper in Vienna? - The Staatsoper was not interested in anything else but my voice. They wanted to know whether it is able to serve the requirements of the role, and that was the one and only thing that mattered. They do not deal with anything mined out from the background and they do not construe them into one’s life. However I regarded the television’s talent show a kind of culture mission. According to the indications received, lots of people have taken up liking to classical music through my performance. They went to the Opera House and realized that is quite another experience as it had been in their childhood when they were embarrassed and did not understand anything at all. I think it was just a fine and noble thing nevertheless I am aware of the fact that there are many who condemn it. I would be glad if one or two singers who have had classic music training could get into some of the talent shows. - Don’t you think that the critics fearing for the rank and place of classic music make your domestic career more difficult? - I don’t feel like so. I will have a concert in the Italian Culture Institute, I received an invitation from the Palace of Arts and from the Philharmonic Orchestra of Debrecen and I am also going to launch my church concert tour. Tamás Vásáry also undertook the task of conducting the Symphonic Orchestra of Szombathely on the charity introduction concert of my new CD, titled Feast on 14th December in the Congress Centre. - How was the programme of the CD set? In ninety percent it includes classic recordings; the rest was selected from Christmas evergreens. When I was figuring out the CD, different Christmas feelings and spirits appeared in my mind: cooking and baking for the holidays, the peaceful expectations and the pictures of the Christmas dinner, so I did my best to achieve that the CD could be a worthy accompaniment to all of these situations both in its spiritual and musical content. It was my main ambition that everybody could be able to find his/her own holiday in it: including those who are religious and who seek more cheerful experiences at Christmas. - Your interest in crossover, the mixing of the styles is reflected in your career, in your interviews and in your recordings. But how can it be realized to keep the aesthetic value of the classic music and at the same time achieve that the crossover could be something more than syncopated percussion effects of “classics in disco rhythm”? The album titled Feast won the Gold Record in the classical music category already on the day of its release. “Besides I have been preparing for a festive collection since my first CD was issued, it is a special pleasure for me to present such an album which is really a unique one in the whole world, as no Christmas collection has ever been released from a male soprano on which all of the pieces were recorded with the accompaniment of a symphonic orchestra.” There are 13 classic and evergreen Christmas songs on the album including one of the most famous festive piece, the White Christmas, but we can even listen to the Let it Snow, the Hungarian version of the Have Yourself a Merry Little Christmas with the Hungarian title Legyen úgy as well. It is also a very pleasant surprise that Mr Vásáry demonstrates his extraordinary gift not only in the high ranges of the tunes, but we may easily become convinced that his voice sounds also particularly precise and crystal clear even in the mezzo lage. In the album introducing first night concert – which starts at 8 pm on 14th December in the Budapest Congress Centre – the Symphonic Orchestra of Szombathely and Tamás Vásáry, the world famous conductor, holder of the Kossuth prize will be the contributors. Ballet artists Henriett Tunyogi and Tamás Solymosi will also appear on stage. “In the recent two months I participated in charity dance shows in Rome and London and I am very happy that we organize such a charity program here at home as well. On the occasion of the concert we will present two choreographies with Tamás Solymosi from the second and the third acts of the ballet titled The Nutcracker (Diótörő), Henriette Tunyogi said. 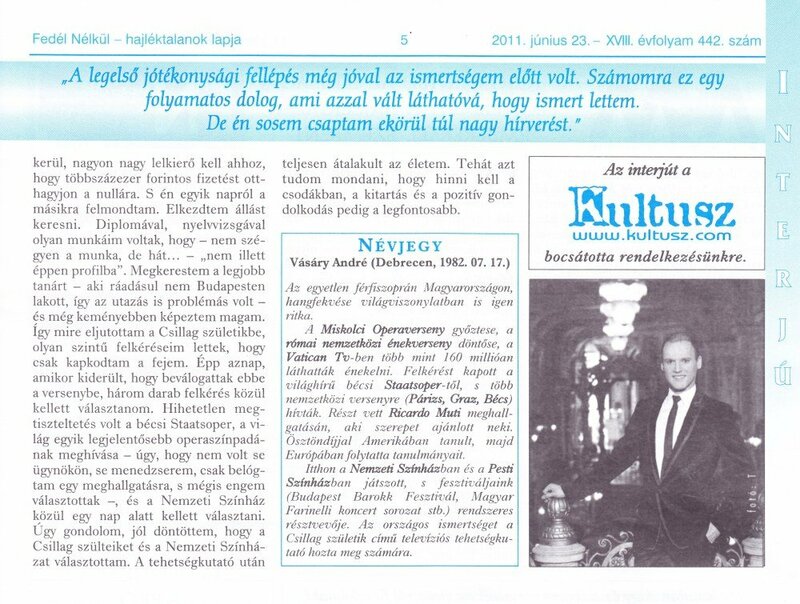 The CD and the concert will serve charitable reasons as part of the income from the sold CDs and the whole profit of the concert will be given to the Trautsch András Olivér Foundation of the I. Child Clinic in the Semmelweis University. There is no male soprano all over the world who has ever presented a Christmas album. Only a few contestants of the talent shows have been able to realize such a spectacular carrier within a year as André Vásáry acknowledged by his peculiar voice succeeded to reach. 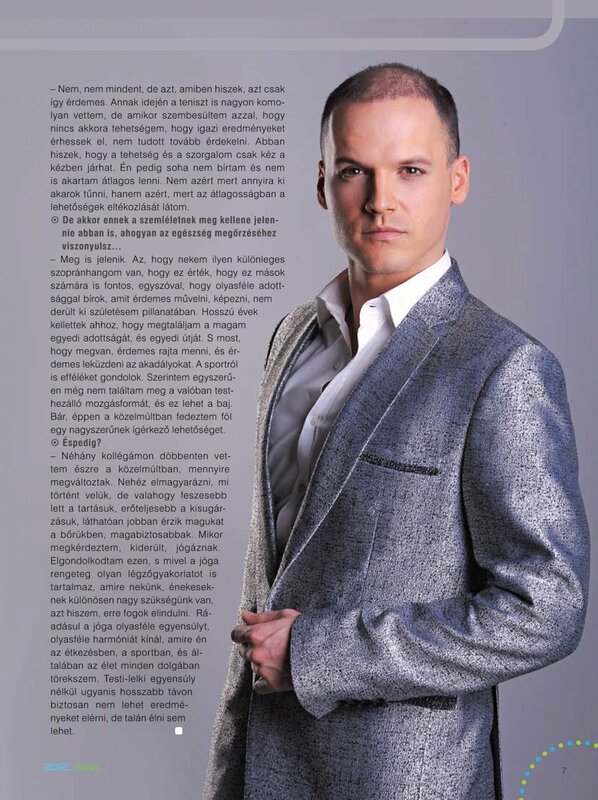 By the end of this year the male soprano known from the Hungary’s Got Talent Show (Csillag születik) can be proud of two (altogether three) albums, the number of his appearances on stage is ever increasing which clearly proves that the audience needs the genre of crossover. This is a good occasion to ask him some questions like what is his opinion about the year 2010, where he is going to spend the year-end holidays and what about love in his private life. The first live performance of André Vásáry’s Christmas album will be held on 14th December at 8 pm in the Budapest Congress Centre. Becoming an “angel” he has presented us a wonderful and extremely unique Christmas album the first performance of which is going to be held on the occasion of the holidays. Once upon a time there was a little boy, with unique voice, destiny changing desires, and wonderful dreams, but not always with a happy Christmas. A part of these dreams has become evident these days and in the last few years he was already able to look forward to the Holy Feast with love and joy as well. I was talking about these topics with the talented male soprano having tear-jerking voice. - What does Christmas mean to you? - As a child, this holiday has never really touched me, though I regarded it a beautiful feast. A little later there was a period in my life when my relationship with my parents became quite strained, so the Christmas feasts of that time should really be forgotten, I felt, that we had been nice to each other only for the sake of Christmas. Years have passed since, and somehow I suddenly realized the importance of Christmas. - I perceived that Christmas had a tremendous power of keeping people together. It helps them to settle their problems in their relationship. It not only provides opportunity for people to be together, but helps them to mend and settle their connections, and talk about things they have been unable before. - Have you had an experience like that? - Nothing concrete, but a few years ago I managed to experience this particular binding power. There was a time when I was studying in the United States, and the parents of a friend invited me and some of my classmates to a Christmas party. We were at least 20-25 of us there. It is a tradition in the USA, that on 24th December people get together, prepare Christmas dishes and finally sit around the festive table to have a nice dinner. They open the presents in the morning of 25th and spend that day together, too. I enjoyed this particular Christmas very much. Although I am not keen on cooking I enjoyed taking part even in the kitchen work. I was only missing my closest loved ones, who were in Hungary. I think that was the very occasion I understood the importance of Christmas or it is better to say, that perhaps I had become matured for the Christmas holiday by then. - This year you are going to celebrate it by releasing an own Christmas album, which, with the preliminary orders has already reached the criteria of gaining the Golden record status. How do you feel about it? 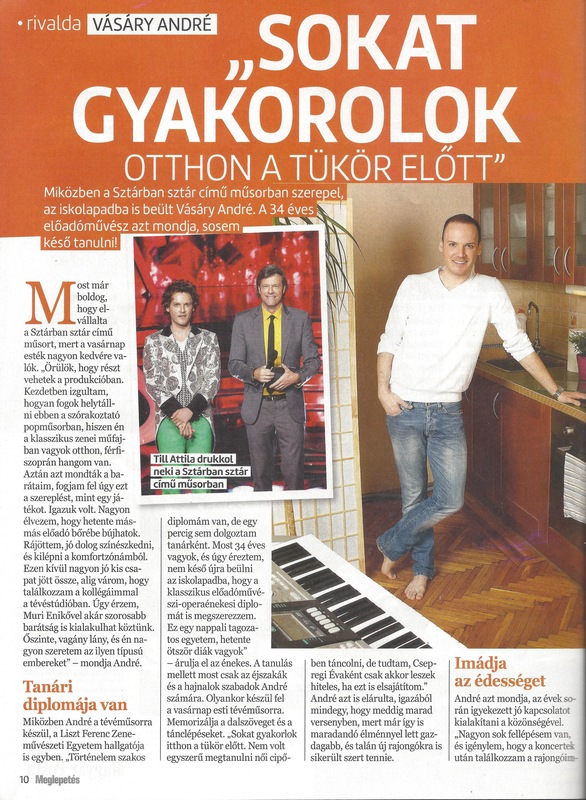 - I'm very proud of it, because nowadays it is really a big deal in Hungary, particularly with festive songs. An own Christmas album has been my dream for a long time. I dare say that I have been longing for that since I started singing - and that was long before the final of that TV talent show! It was not simply an own album I wanted, but an own Christmas album especially. - Why just exactly a Christmas album? - This question has come up even in professional circles, as it seems to be quite an average project to release a CD of this type. 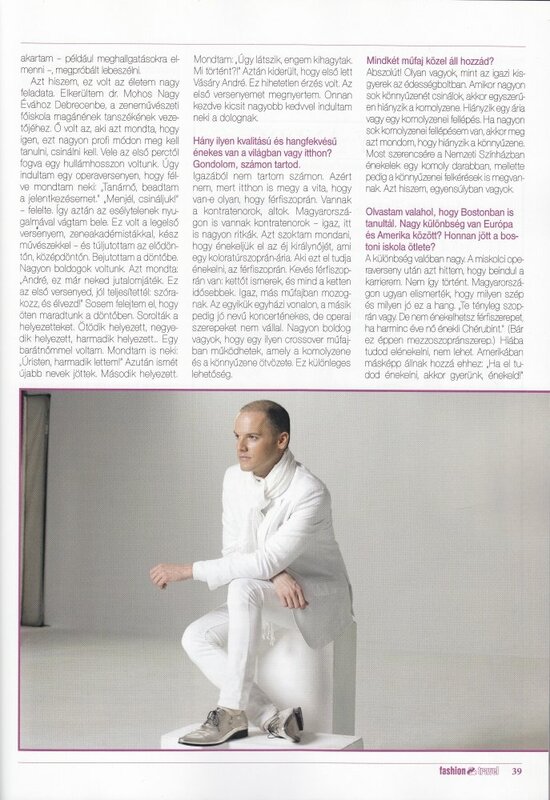 My new album however is much more than just singing Angel from Heaven ("Mennyből az angyal”) on a synthesizer base. 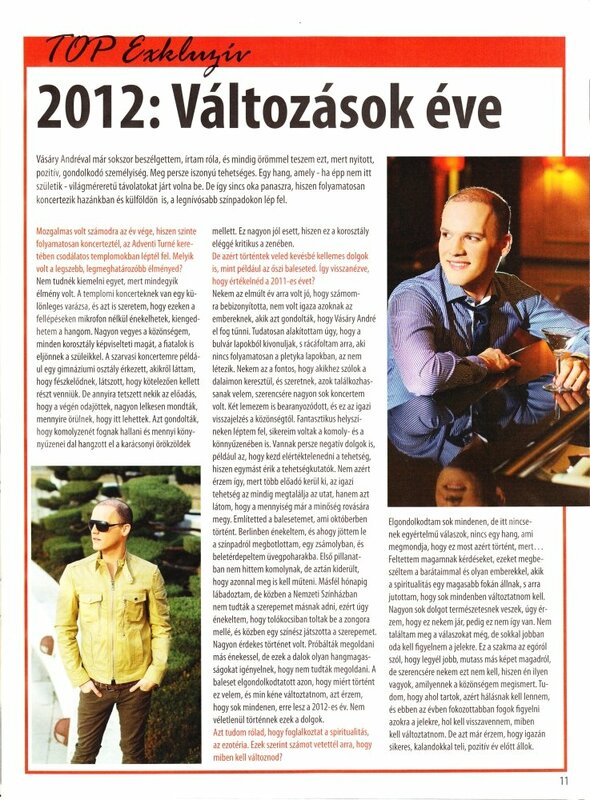 Nobody has released anything like that before in Hungary, so I can call it a music-historical event without talking big. One of its specialities is that all of the 13 songs have been recorded with a symphonic orchestra, and due to this, they sound really wonderful. - What style can be heard on the album? - Well known Christmas evergreens, and popular classics as well. I'm proud of the experience that many of the people who have already heard them burst into tears. In all of my life I have been longing for inducing intensive emotions in the people with what I provide them. - As far as I know, the album has got still one more peculiarity. I think of that remarkable duet you sing with yourself. How was this idea born? - The reason is that sometimes fate can be a better organizer than anyone else. I preferred to have a duet on the album, and I had a few ideas who my partner should be. In the end, for some reason we were unable to create common production with any of them – but as I had already recorded a demo to show to my would-be partners, we kept the original version. That’s why I sing a duet with myself. - It is said, that you always choose the songs for a concert on the very day of it. Compared to this, how long did it take you to select the songs of this album? - Will there be a first performance concert of the new album? - Yes sure. On 14th December, in the Budapest Congress Centre (Budapesti Kongresszusi Központ), we are going to organize a charity concert. With buying a ticket everybody will support the Child Clinic No.1. Music will be provided by the Symphonic Orchestra of Szombathely conducted by Tamás Vásáry, the renowned pianist. The artists, Henriett Tunyogi and Tamás Solymosi will perform a piece of ballet. - After having given us this present, what do you wish to get from the angel of Christmas? - Happiness, because it indicates that everything in my life works as it should. - What does that actually mean? - First of all professional successes. 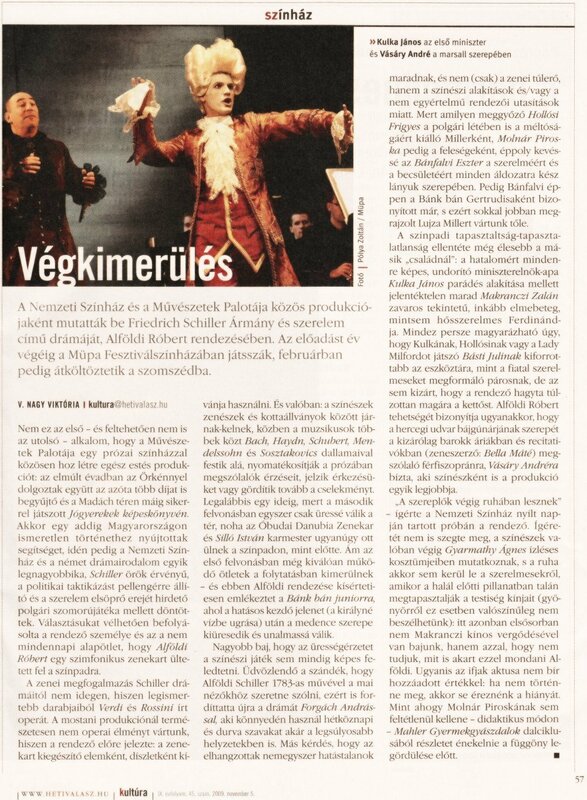 Lots of concerts where I can sing, and impress the audience, and such honours like the opportunity to appear on stage at the National Theatre (Nemzeti Színház), in Schiller's Intrigue and Love (Ármány és szerelem ) directed by Róbert Alföldi and to play together with artists like Juli Básti, János Kulka, Piroska Molnár, and Frigyes Hollósi. I also believe and wish that one day this country will be proud of me. And of course, a satisfied private life is also needed to the happiness. - Let it be so! Observing the course of his life André Vásáry seems to have always taken up very enjoyable and attractive work. Driven by his curiosity and dreams, he became a flight attendant for a short while following a few years of modelling. 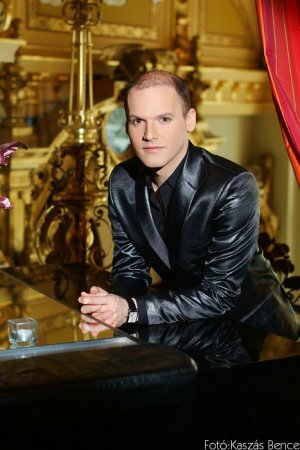 His present occupation, due to his special vocal talent, is an envied and unusual one - he is a male soprano opera singer. Horizon talked to the young man (who these days is 'only' a passenger on board) about his relationship with aviation. ANDRÉ VÁSÁRY AS WE'VE NEVER SEEN BEFORE! The unique voiced singer mentored by the two actor geniuses János Kulka and Róbert Alföldi has recently presented a brand new side of himself. André Vásáry's program scheme always depends on his actual mood, and maybe even on the weather, as well. André Vásáry made a new – spotty four legged - friend when he decided to learn horse-riding. André Vásáry was Xaver Varnus' guest at his Balaton mansion. The organist organized a concert for young talents, where the star of the Hungary’s Got Talent Show (Csillag születik) also had a performance. André Vásáry impressed the audience on the stage of the Hungary’s Got Talent Show (Csillag születik), and indeed, singing a classic opera is not at all an easy feat. Not only an incredible voice but good condition is needed as well. Although he does not consider himself a master-chef, André Vásáry is able to conjure quite a good menu on the table with his mother on the phone, assisting. The talented singer opts for lighter courses, since having good figure is important even on the opera stage. 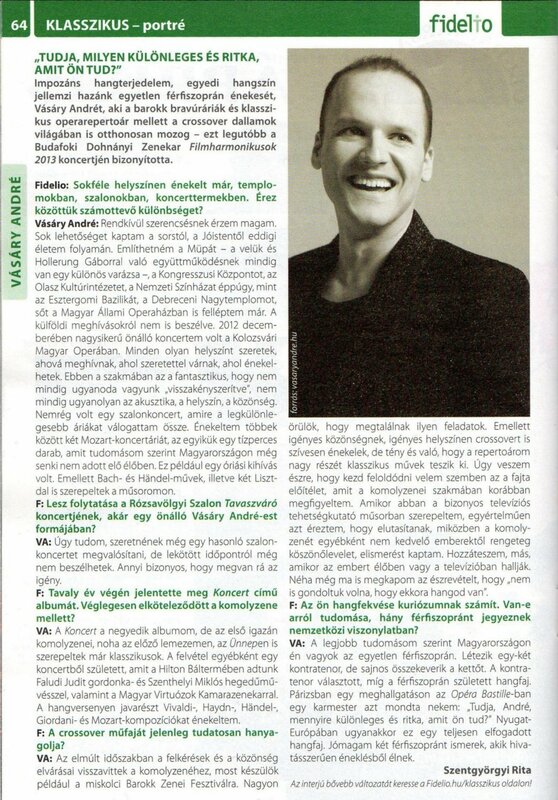 André Vásáry has fascinated both the audience and the jury of the Hungary’s Got Talent Show (Csillag Születik) with his extraordinary sopran voice. Since then his first original album has been released through the varied musical styles of which we can get acquainted with the different sides of the singer . It is by no means worth missing this musical experience. 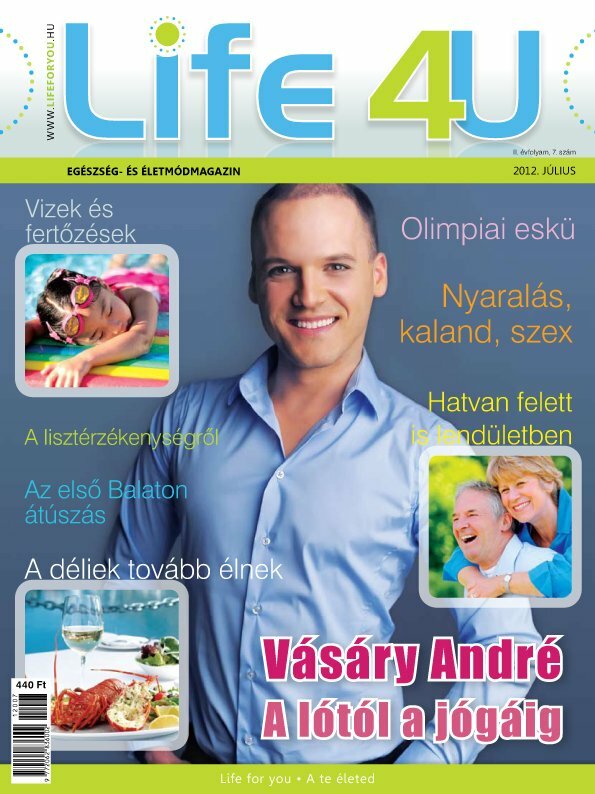 André’s life has been basically changed since the Hungary’s Got Talent Show (Csillag Születik). His first album is already available and he goes from one performance to the other. Although he has almost no free time at all he readily welcomed us in his home. One of the special surprises of the program series in the Esztergom Castle Theatre this year included André Vásáry’s art performance. Due to the heavy rain last Saturday the program planned to be organized in the Castle Theatre was relocated to the synagogue. After the concert we had the chance to talk to the singing artist André Vásáry in the dressing-room. 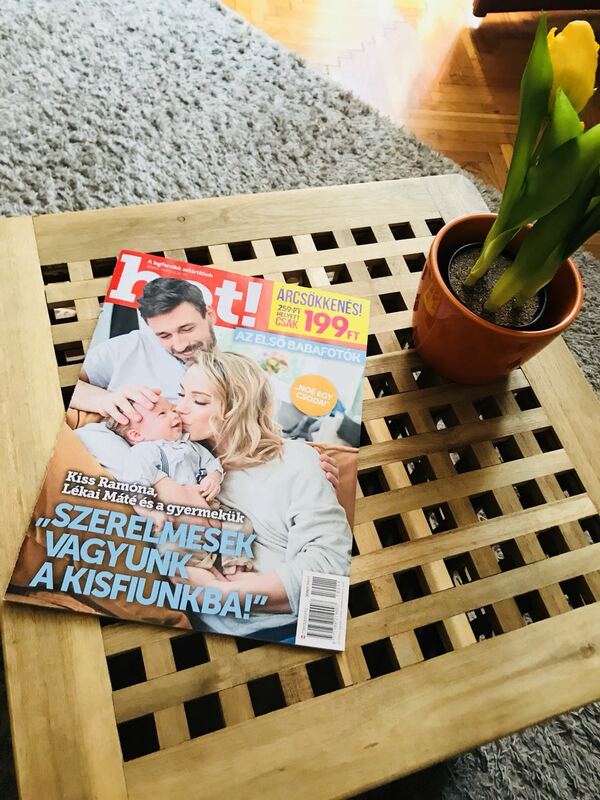 This week the readers of Star Magazine get the chance to take a peek into the home of André Vásáry whom you got acquainted with in the Hungary’s Got Talent TV Show in 2009 . André was pleased to show us around his home, and told us why certain places of it were so special to him. Instead of a long vacation in Spain, André took the chance only to visit Croatia, and Lake Balaton. But he didn’t mind it at all, since he was still an infant when he last visited the Hungarian Sea'. The male soprano is an extremely rare lage. In the 18th century the life of many young boys have been destroyed by making castration on them in the hope they could become talented singers. The most well-known male soprano of the era was Farinelli, for whom opera roles were especially written by several composers. He arrives to the interview just precisely on the dot. Behind the somewhat serious look we find a kind, open-minded, enthusiastic young man. At first he is a bit strained as he has never been taken photos at such a large scale before but finally he starts to feel comfortable and shows his real personality. He discloses what kind of a partner he longs for and that it was only a little short of that the world became poorer with his talent. Male soprano – this is a type of voice being very rare over here. A Hungarian young man, André Vásáry is the owner of this voice. Last November he was one of those ten thousand competitors who – from among the more than four hundred thousand participants – got to the final of the singing contest Concorso Internationale Musica di Sacra in Rome. After this successful appearance André Vásáry was invited by Ricardo Muti, the director of the Ravenna Festival for a hearing, from where he returned home just a short time ago. – It was an aria from an opera of Jamelli that I had been asked to sing by Muti, as he would work in the Salzburg Festival, in the Opera House in Paris and in the Ravenna Festival and he casted singers for the roles of the operas planned to be introduced on these events – he said. – I don’t know anything about the result of the hearing, yet. I used to mention – because it is not well-known even in our profession – that the voice range of the male soprano is not the same as that of the counter-tenor; the letter corresponds unequivocally to alto, while the voice range of the male soprano is quite identical with that of the soprano. The countertenor is said to be a chosen type of voice, while the male soprano is born with the ability. The majority of the male soprano roles of the opera literature can be found among the baroque operas – in that age they were performed by castrated singers – but the artist of that voice type is able to sing most of the pant roles of the later pieces. – Unfortunately in Hungary only a few people accept if a pant role is sung by a man, but it is becoming more and more common abroad – says André Vásáry and adds that he has learnt in the Boston Conservatory with a scholarship as a pupil of Victor Jannett, and played the role of Cherubin and Oscar and appeared on concerts as well. - Some years before I took part in a hearing in the Budapest Opera House and I was offered an alto role in the opera of Händel titled Xerxes, but this role should rather be sung by a countertenor. It was not my street at all, so I could not undertake it. The name of André Vásáry is not too much known in Hungary yet. He sings in the Pesti Theater in a baroque comedy of Peter Esterházy, and sometimes he receives requests for a concert, too. Recently he went on stage with the Tomkins Singing Group and Miklós Perényi in the leading lady role of Carissimi’s oratorio titled Jephte and at Christmas he had an own concert in the City’s Saint Michael church of Budapest (Belvárosi Szent Mihály church) accompanied by Erzsébet Áchim organ artist. – It is very important – he mentions – to have an excellent master teacher and a very good manager. I have started my studies in Debrecen and I have a lot to thank to Éva Mohos Nagy, the senior lecturer of the Music Faculty of the Debrecen University and I am also grateful to Magda Nádor and Emese F. Kármán, my present teacher. The young artist won the Regional Singing Contest in Miskolc, but he didn’t become noticed too much even after… Then he went to learn to Boston. André Vásáry has also captivated the hearts of those Hungarians who live in Slovakia. He had a performance in Rozsnyó where even leading politicians congratulated him. As one of our readers, László reported André was not able to cope with signing autographs. This was the first foreign journey of the star of the Hungary’s Got Talent Show where he appeared before Hungarians living abroad. He was invited to a political program, where among others Szandi and Pál Makrai also performed some songs. - Slovakia is now in the thick of the election campaign and there were more programs included to which stars had been invited from Hungary. André Vásáry winded his way into the hearts of the Hungarians living there already after his first sound – as our reader-reporter, László told the story, whom we naturally pay 10 thousand Forint for the photo. The leader of the Hungarian Coalition Party, Pál Csáky, who watched the performance from the window of the Town Hall, also spoke of him in high terms. As André had finished his program, the audience including the Hungarians living in Slovakia, rushed him for autographs, and for common photos with him. He was almost unable to cope with the requests. Finally he had to hurry back to Miskolc to give another performance. - I was very much pleased with the warm reception that I received here – he said. – I would not have thought I have so many fans even beyond the borders. I have never performed before Hungarians living abroad, but it is already sure that I return here to the Highlands, soon. I have nothing to do with politics, but I cross my fingers for the local Hungarians to elect successfully. André Vásáry always receives lots of performance requests from abroad, but unfortunately he was unable to meet all of them lately. And the other day he enraged 150 local fans as well, although it was not at all his fault. He hasn't been to Debrecen for such a long time, that he couldn't see his sister being big with a child. But he is able to cradle her goddaugther for the first time now since when she was born. The opera singer André Vásáry represented Hungary in the singing contest of the Concorso Internationale Musica di Sacra which was organized between 3rd and 9th November this year in Rome. 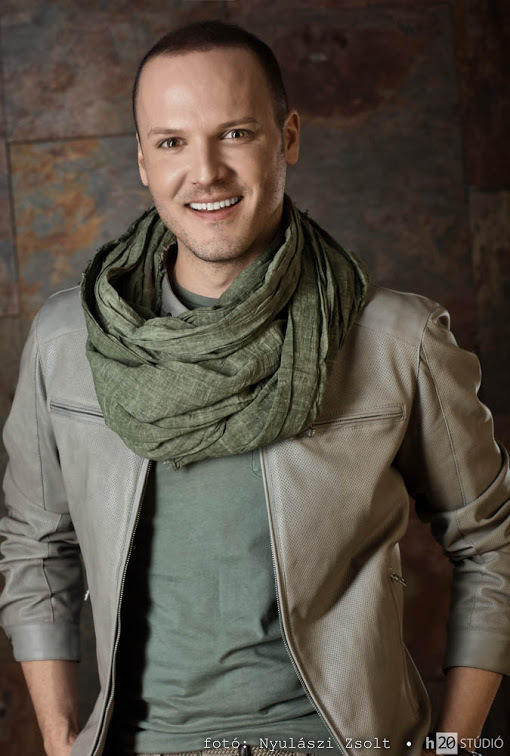 From among the more than 300 singers arriving from all parts of the world, the young Hungarian singer having an extraordinarily specific type of voice succeeded to get into the final as being the first male soprano there in the 30 years history of the contest. The winning singers of the previous contests were also invited to the competition. The jury included the leaders of the Opera Houses of Hamburg and Naples, the musical director of BBC, and numerous managers of agencies. The contest was broadcasted live by the Vatican Television Telepace, so the competition could get through to 160 million people. The final took place in the SS XII Apostle Basilica, on which both the members of diplomacy and the upper-class elite of Rome were also present. The young singer presented one aria from each of the composers Händel, Mozart, Bach and Carissimi by name. Boston Conservatory with scholarship. After this for the request of EMI Hungary, he came home and completed his first album in the crossover style, with the title Mesterdalnok (Mastersinger). Following the edition of this CD, he returned to classical music. His present master is Emese F. Kármán; previously he was taught by Magda Nádor. In October he sang the role of Filia in the oratorio titled Jephte of Carissimi in the Vivaldi 330 III. Budapest Baroque Festival with the Tomkins Singing Group of Budapest, accompanied by the cello artist Miklós Perényi. He also appears in the play of Esterházy titled Rubens, directed by János Szikora, which is to be seen next time in Siófok on the 30th November and which is going to be also presented in the Pesti Theatre on the 14th December. Together with Erzsébet Áchim organ artist, he will present a Christmas concert in the Belvárosi Szent Mihály (City’s Saint Michael) Church on 19th December, where the audience will be provided with the pieces of Bach, Fauré, Franck, Gounod, Händel and Regel among others. 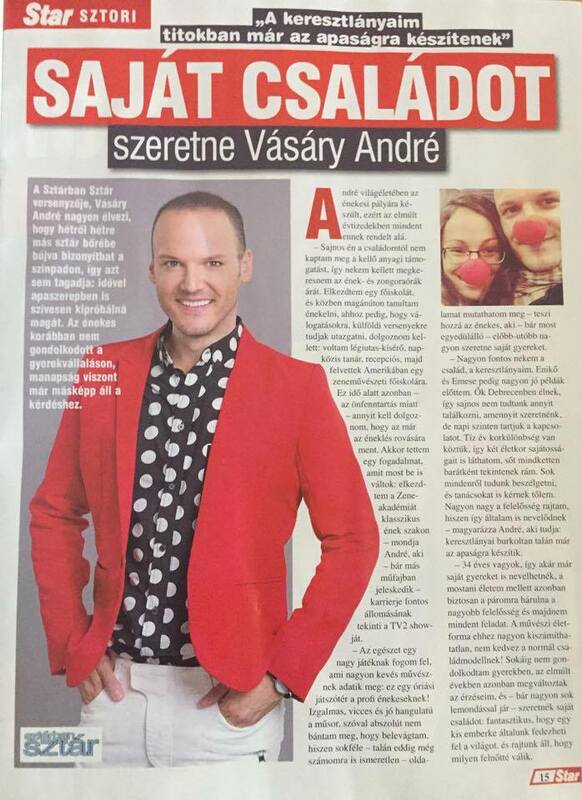 We have already met really unique talents on the stage of the Hungary’s Got Talent TV Show, who have good chance to get into the music history of Hungary, but this Saturday André Vásáry made such a sparkling parade before the eyes of the jury which is in a way incomparable in the whole world. The singer is literally a born talent, as he is gifted with such a voice which any of the opera singers may begrudge: in spite of being a man he is able to sing out extra high sounds; he works in the soprano lage which even internationally is quite unique. - I was born like that indeed and this ability of mine has been noticed even at a very young age, but I started to work on it very late – we were informed by André Vásáry, who undertook singing lessons only after his eighteenth birthday, but not just anywhere. He mastered the ins and outs of singing in the most renowned institutions of Hungary and the United States. As for his art, he definitely wants to make a living of it in the future. Although sometimes he sings pop songs and he likes the genres of light music as well, he feels them a bit far from himself, so he is going to remain in the world of the opera and musical and he also plans to try himself in the crossover style: - It is a mixture of light and classical music. Just like the activity of Andrea Bocelli or what we can hear in the aria of the Fifth Element. I have already been planning to sing that for a long time now! 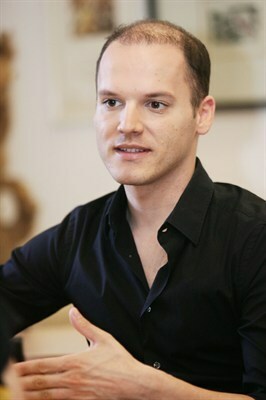 The opera singer has been asked for playing one of the roles of Intrigue and Love (Ármány és Szerelem) by Róbert Alföldi. 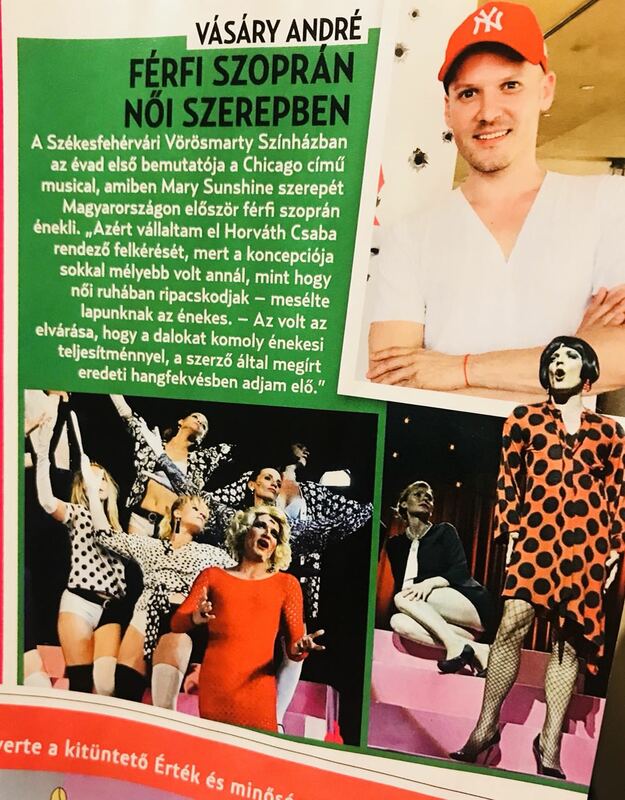 According to Vásáry’s information, apart from István Tabáni, he is one of the most frequently occupied contestants from the second series of the Hungary’s Got Talent TV Show (Csillag Születik), but he still does not think that he should rival with anybody else. Róbert Alföldi, director of the National Theatre has personally requested him to accept a role in Schiller’s Intrigue and Love directed also by him. The finalist of the Hungary’s Got Talent show (Csillag születik) will form the court marshal named von Kalb, and will be on stage together with well-known actors like János Kulka, Juli Básti and Piroska Molnár. It is a pleasant surprise for the opera singer that he received a warm welcome not only by the branch of artists, but by the average people as well, who turn to him with a rather positive attitude, including not only the members of the elder age groups but even the young ones. „I have not expected that, but now I am regularly stopped in the street, people congratulate me, wave and smile at me. Face to face I have experienced only positive feedbacks” he said to Velvet. However he often seems to accept negative critic badly, he says that if someone enters a television talent show he has to stand the assaults and interest. „ I am well aware of the reality that after a while it will decline, but I think, I am able to manage it rather well now. I try to react positively to everything and I have an adequate attitude towards all situations I have to face. I take no notice of negative remarks as I do not read any forums or comments. According to his opinion this can be the reason that he has not received any slaps so far either physically or theoretically. Finally it turned out that according to the opera singer it was no use regarding any of the contestants to be his rival, as it would be the audience to make the final decision at the end. „Doing so, I could achieve nothing but poisoning and stressing myself. The audience is going to choose whose concert to visit and whose CD to buy” he explained, and added, that the crossover style is so much new in Hungary that he actually has no rival at all. 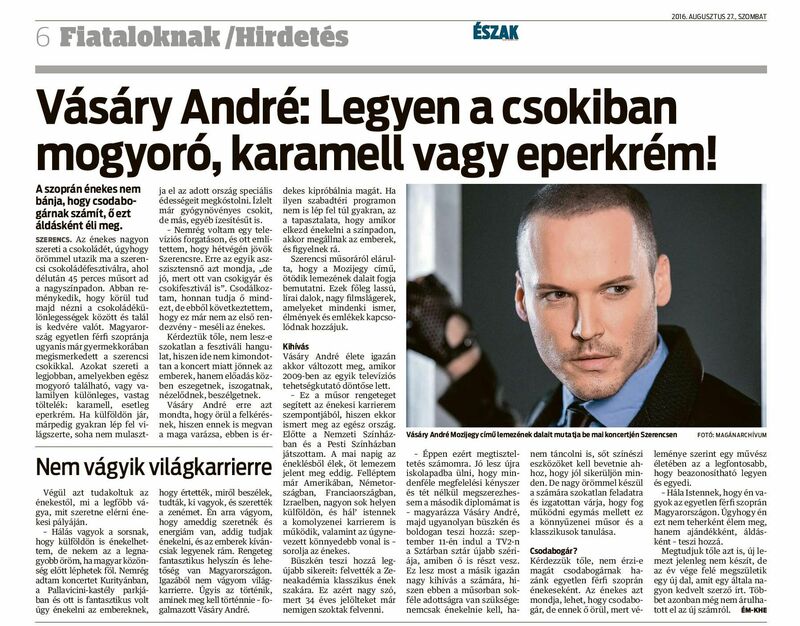 André Vásáry, coming from Debrecen, got through the first qualifying round of the Hungary’s Got Talent TV Show (Csillag Születik) by his extraordinary voice that is not at all too common among male singers, with performing an Ennio Morricone song. In the following interview given to Hajdú-Online he was talking about the beginnings, as well. „I started to learn singing 10 years ago in Debrecen. Even at primary school my teachers spotted that I have some affinity to music, and they attempted to guide me to this direction, but that time I was not interested. I started taking lessons from a private teacher at the age of 18. It turned out to be even useful that I started it a bit later, because by that time I had got over the boys’ voice changing period.” said the singer from Debrecen, who had got into the Hungary’s Got Talent show. „It was Éva Mohos Nagy, head of the Faculty of Music in the University of Debrecen whom I consider to be my first master, although she was not my first teacher. As I am a male soprano, which is a very rare voice type, not to be mixed up with countertenor, we could find out only step by step what kind of music, and what roles I could sing” he added. André says that he feels himself comfortable both in pop or classical music and even in the mixture of these two, called crossover which is not far from him either. „In classical music, the baroque operas have been inevitably written for my voice. It may sound odd, but those roles fit me the best which, at the time of their birth, could only be performed by castrated singers. Nowadays these roles are performed by women singers, but I am the living example that even in our age it is possible to sing as a male soprano without being castrated. There are roles in Händel’s and Mozart’s works to which my voice also suits, but I have already sung something from Verdi as well, though he does not belong to the baroque era, says the soprano, who, in the crossover style, prefers the songs of Andrea Bocelli or Sarah Brightman, and also intends to perform them in the show later. André Vásáry trusts to get on in the show as far as possible, and he also does his best to achieve it. 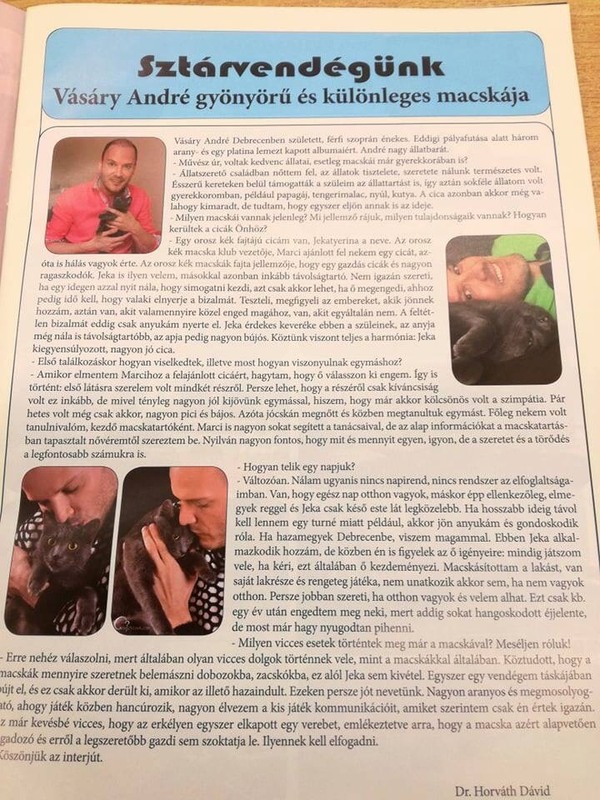 What is more, he hopes to become the first „little star” who could be voted for in a local patriotic spirit by the inhabitants of his home-land, Hajdúság (Hajdú County). The singer of the Hungary’s Got Talent show is so much critical of himself, as his family is not willing to watch videos of his performances together with him. His grandma even cries sometimes; she doesn’t understand why his grandson hurts himself, since he has already proved his talent multiple times. It seems that the angel voiced singer who appeared in the Hungary’s Got Talent show is successful in almost all fields of life. André Vásáry lives among memories. The finalist of the Hungary’s Got Talent show says that an apartment is homely if it is filled with things being dear to him. While many people say that a rented apartment can't be really cosy, the singer says that he managed to make it one like that. The Hungarian light music scene has neglected him, his parents have put across his way wherever possible, but he has always kept on his path. He has done it while taking up other jobs, and having no money, for 10 years. Today, he doesn't understand where all that energy has come from. Who would have thought that the contestant of the Hungary’s Got Talent show slams doors sometimes? And what about the fact that he has never been in love? Or he would immediately leave his companion, if cheated? André Vásáry honestly reported our magazine about his innermost secrets and love life. In the course of the Hungary’s Got Talent show, we met both his emotional and serious side, but in everyday life however, being cheerful is much more like André. A unique phenomenon. A male soprano. His awards and performances do not mean, that he has reached his target. André Vásáry says, that a singer - just like a good priest – always learns until the end. He entered the Hungary’s Got Talent show 2009 just out of mere curiousity. As a child André Vásáry had three dreams: to become a flight attendant, a history teacher, and a singer. By now he has succeeded to achieve all of his three dreams. The soprano voiced competitor provoked mixed estimations and obviously divided the audiance: he was both adored and hated. I couldn't make up my mind whether to like or dislike him, so I invited him to have a cup of tea. André accepts that the viewers favoured somebody else, but it hurts him nonetheless. WHAT CAUSES A MAN TO HAVE SUCH A PECULIAR VOICE? It seems, there is no groups of people nowadays, the members of which would not raise the question while listening to André: what causes a man to have such a peculiar voice? Really, what? For years, André Vásáry has not been able to decide whether his male soprano voice was a curse or a blessing. Even his family had difficulties with accepting the opera singer. A whole nation picked up on André Vásáry's unique voice a few weeks ago. Perhaps many - who only heard him sing - believed, that a woman was singing. That is not the case however: his incredible high voice range of what female sopranos could even be proud of is coming out from the throat of a man. 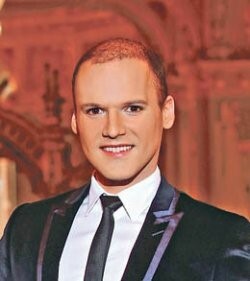 But who is this fantastic singer and why did he checked in to compete in the Hungary’s Got Talent show? The crowd listened to André in perfect silence and he, with his male soprano voice, made them stand up while cheering and applausing after the performance. It was as if an angel would have flied over the hall. His teachers sent him to see the doctor saying that no man can have that kind of voice by birth. André Vásáry's multi-octave tone isn't the result of some organic deformation - it is due simply to his talent. By his age of 26, his extraordinary performance is known and appreciated all around the world. The young Hungarian performer was discovered by the American Capital Records last year. André Vásáry's voice is a rare gift from fate. By now he has completed his first solo album, on which he performs a male/female duet - all alone. Coming from Debrecen, he's already been to the United States, worked as a model while he was a student and was also a flight attendant, as well. He is nice, direct, interesting, with a twisty and adventurous life. While this is true for many 26 year olds, there's something about André that is quite rare; in fact you can find such a talent once a decade.